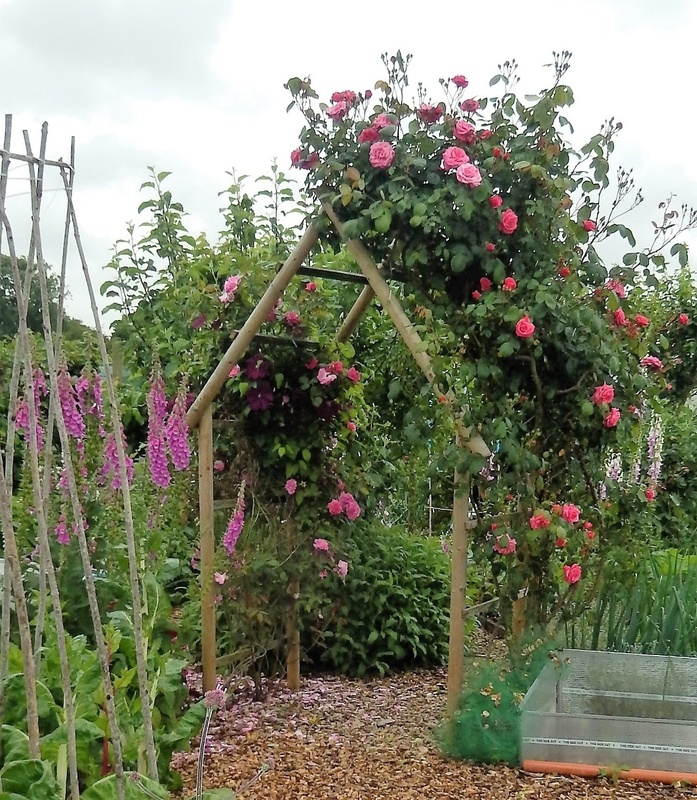 The roses on the arch are at their best, a wall of flowers! Calabrese heads are large and solid, with no sign of slug damage. 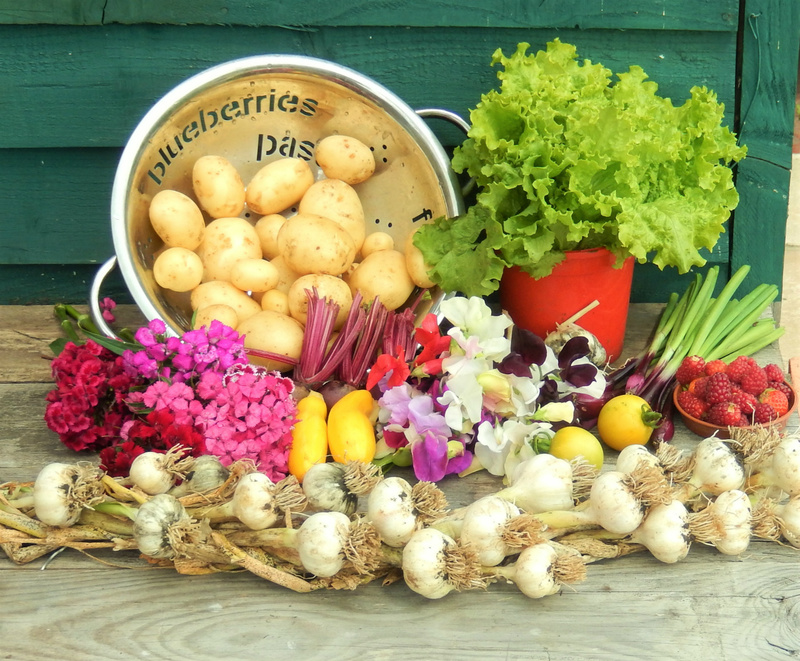 27th June - Harvests begin for real!! 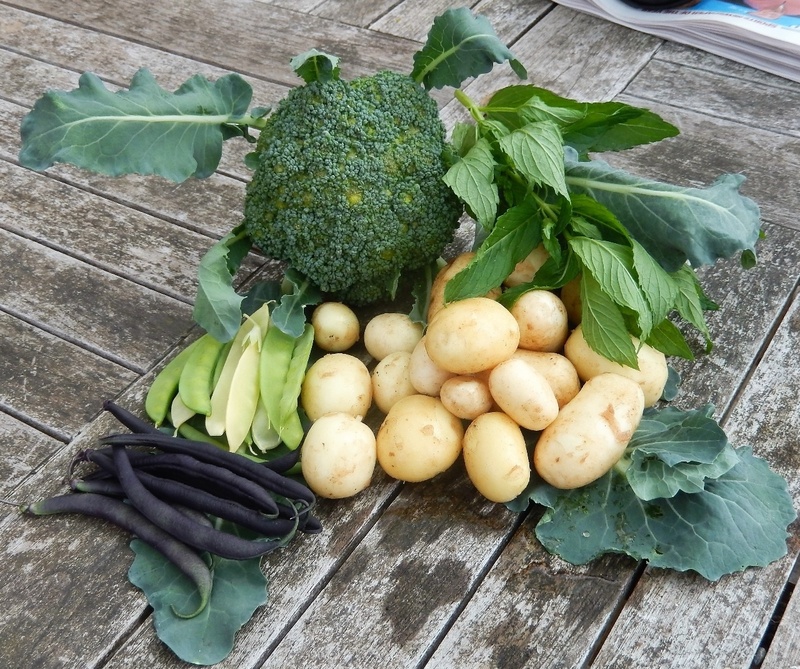 Despite the gloomy weather and the plethora of pests, some crops have continued to grow well and this week we have had several meals from the plot, including a really colourful stir fry last night. 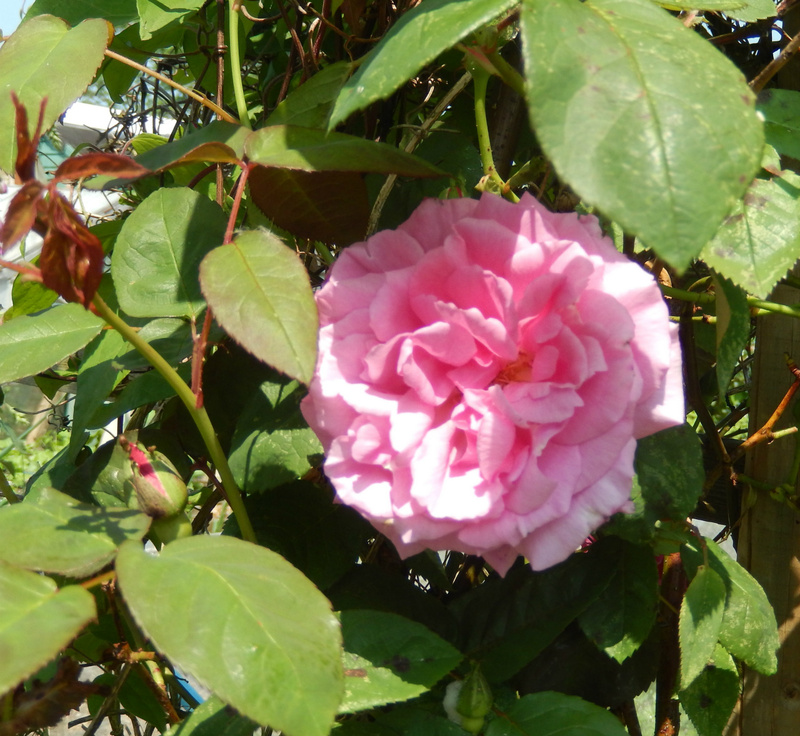 It is the end of June, it shouldn't really be such a surprise, but somehow this year it is! There, nestling in a crown of green leaves, were enormous calabrese heads, whilst the potatoes, although looking quite unassuming, have beautiful white tubers under the ground just waiting to be dug up and eaten. And the garlic was a huge delight. The stems looked straw coloured and boring, but when I dug them up it was clear that the rust on their leaves had not affected the bulbs at all. 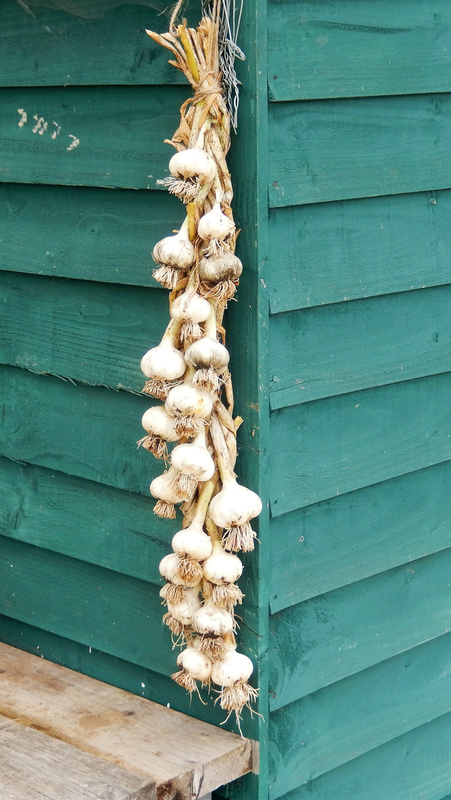 I even managed a garlic plait, which I am very proud of, and hung it up for the bulbs to dry off. Looks good!! Another nice surprise were the carrots. Leaves looking good does not mean the roots are decent too, but this year they are not the strange twisty carrots riddled with maggot tunnels that often appeared at harvest time, but lovely straight clean roots ---hurray! Using the seedtape meant they were well spaced and so did not need thinning, plus the soil was very well prepared and the enviromesh in place right from sowing time: it has definitely paid off. I just hope the others are as good! 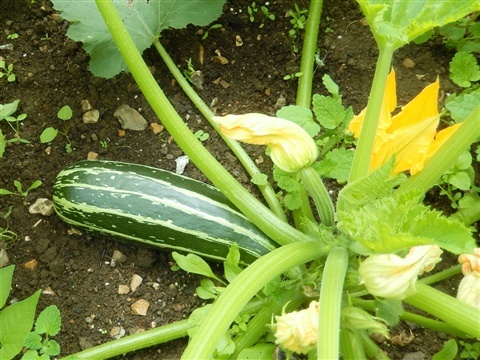 The courgettes plants are massive.The Bianco Longo is absolutely vast, with leaves stretching well over a metre and partially covering the adjoining plants We have had courgettes from most plants now: yellow, green, pale green and round dark green make a nice selection. 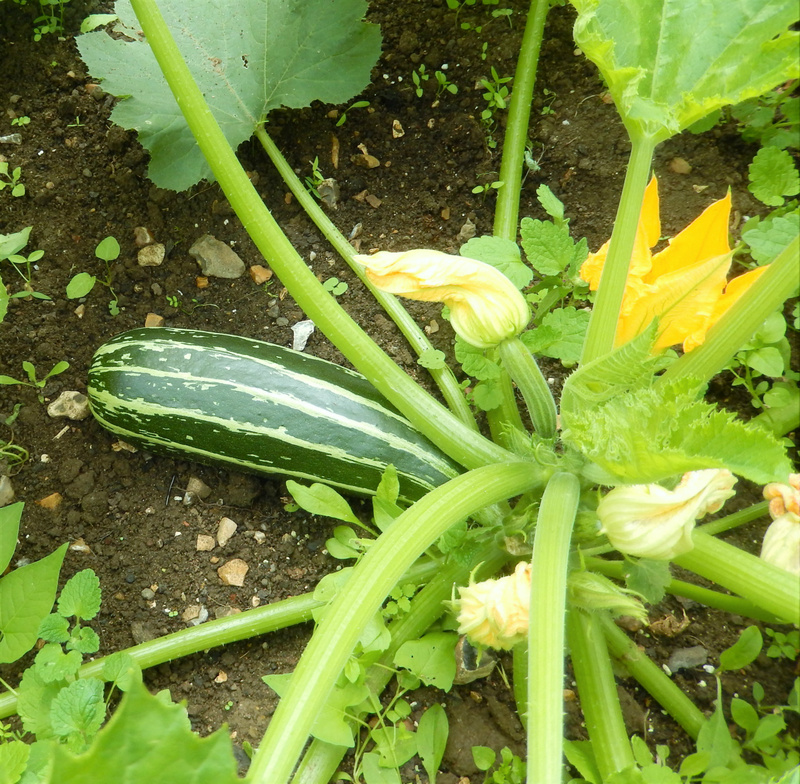 Last year I tried in vain to grow marrows (as opposed to giant courgettes) but this year there are a couple already, growing steadily. 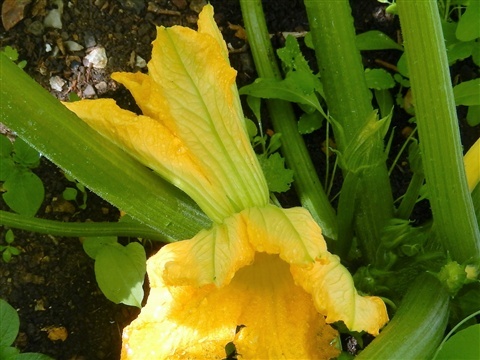 I shall be cutting them before they turn into blimps and will dust off the recipe for marrow and ginger jam. Beans are doing well. 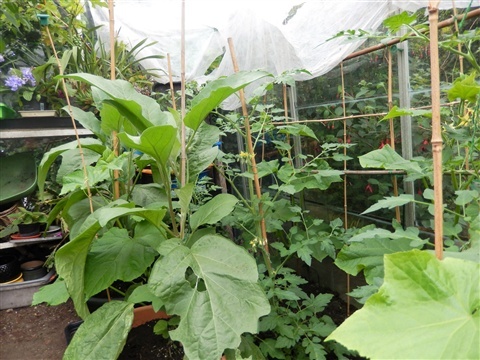 The runner beans are recovering from their yellow leaf phase, thanks to the Epsom salts and are heading up the poles properly, and even have some flower buds now too. The Greek Gigantes are in full flower, whilst all the other drying beans plus the climbing french beans, are almost at the top of their poles, with tiny buds visible. I shall trim them when they get there, so that they bush out a bit, lower down. 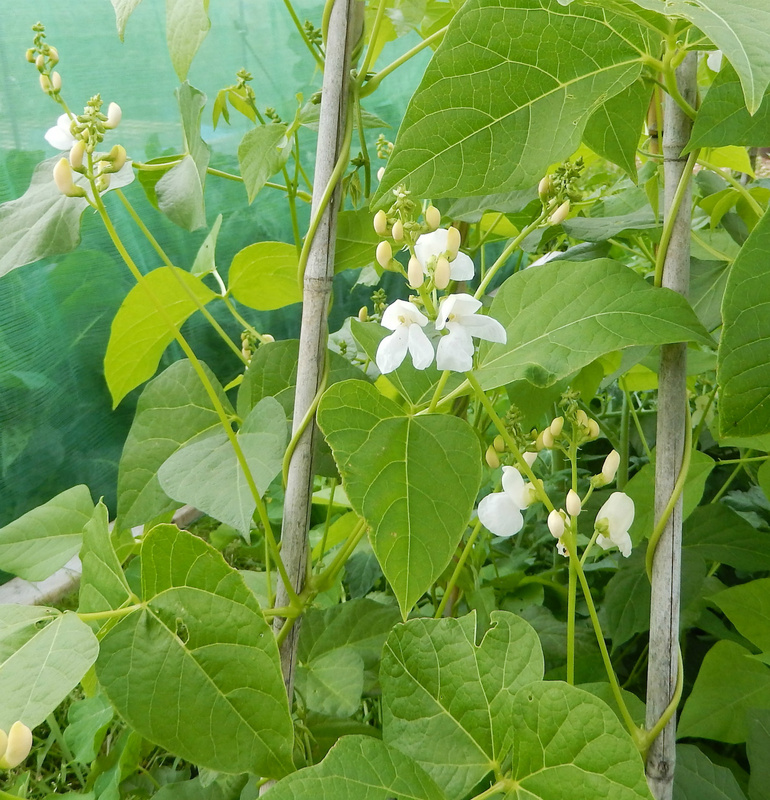 The dwarf french beans in the mini-tunnel are producing plenty of beans and are still flowering too. I think the tomato fertiliser is helping. The peas are struggling on. Enough said. Look at the chickpeas! 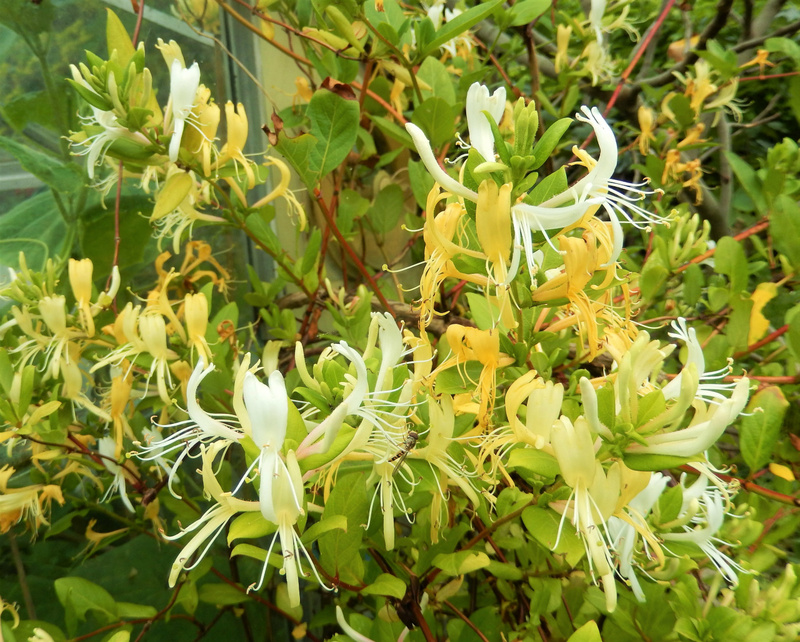 I thought they would sulk without much sunshine, but they are covered in tiny white flowers now. I did put some twiggy sticks around them, but they do seem to be able to support themselves. At least they keep the pigeons off. Quite exciting to be growing somehting new. 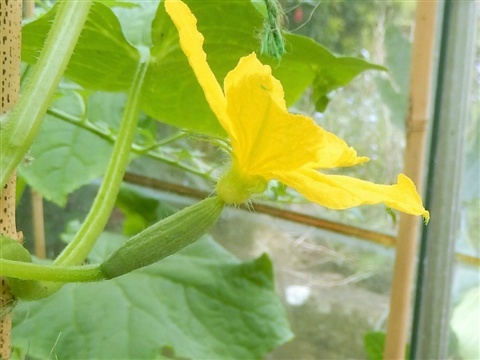 A Bengali family has recently taken over one of the plots on our site, and they are growing some plants that are new to us: gourds grown in depressions in the ground over wire fencing at an angle (looks good!) 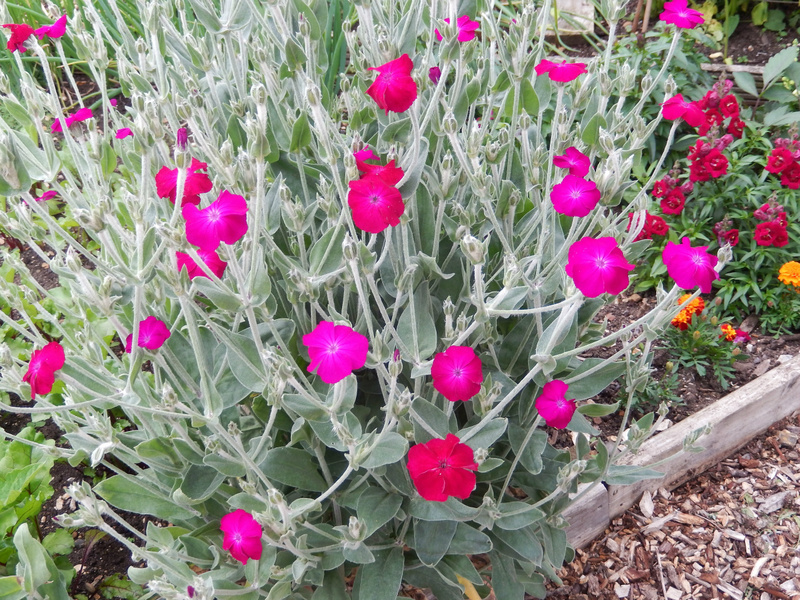 and a purple leaved plant that neither of us recognised, and didn't have an English name. 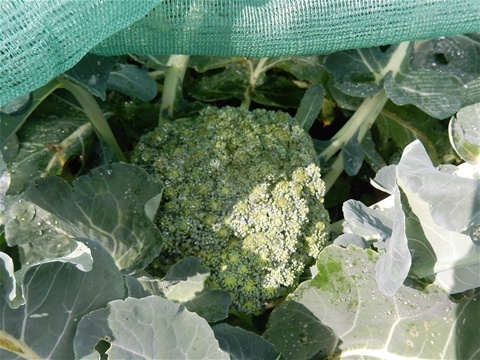 I hope it grows well in our climate so we can find out what it is and how it is cooked. This is the time in the year to prune stone fruit trees such as plum and cherry. 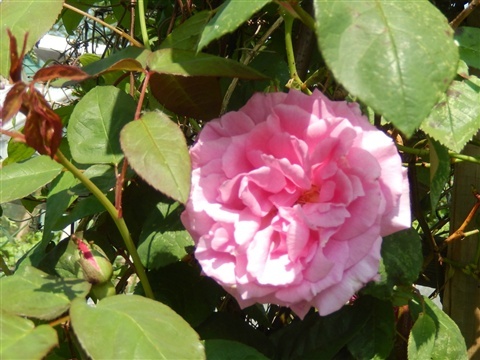 They have had their growth spurt, and doing it now avoids any possibility of silver leaf disease. So this morning it was out with the secateurs and my old plastic chair, so that I could reduce the two large trees -one plum and one cherry- back to a decent shape, instead of having long branches waving in the wind. I also summer-pruned the apple trees on #146, including the Braeburn that has never had so much as a single flower. 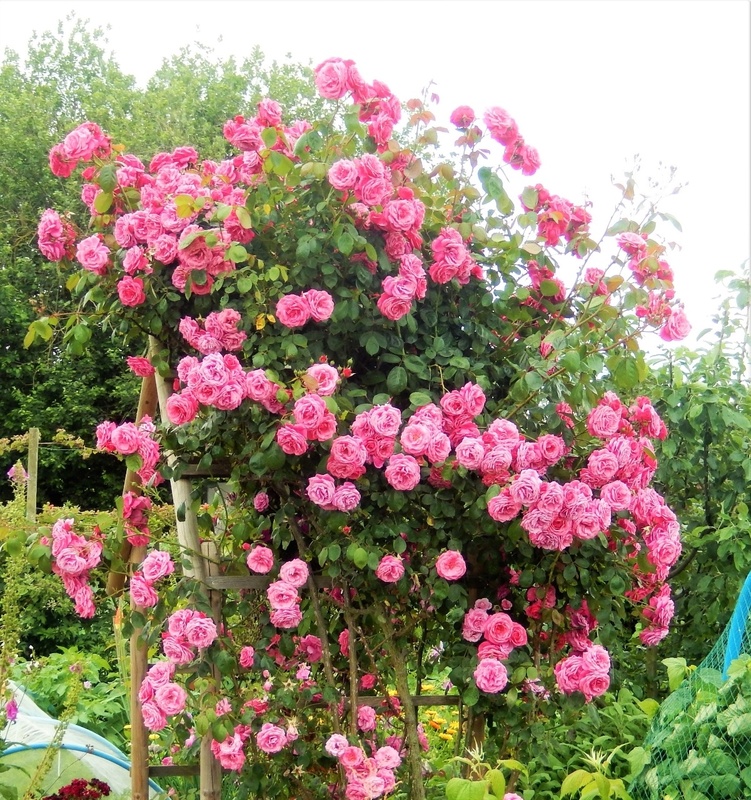 Having taken and followed advice, and just let it be, it is rapidly growing into a nuisance that stops us walking around the plot, so this morning it had a pretty drastic prune. There were however what looked like the beginnings of fruiting buds on last year's wood, so who knows? 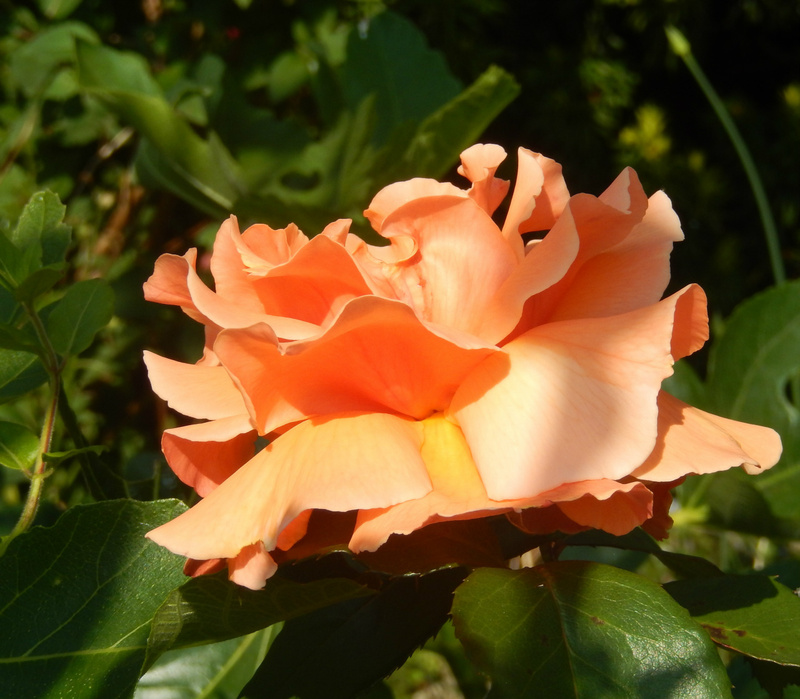 Maybe next Spring will be the time it actually produces some blossom! The apples were all thinned out too, now that the June drop is over, in the hope that we get fewer, larger fruit. It's a good plan anyway! Needless to say, there is no fruit on either the plum or cherry tree. 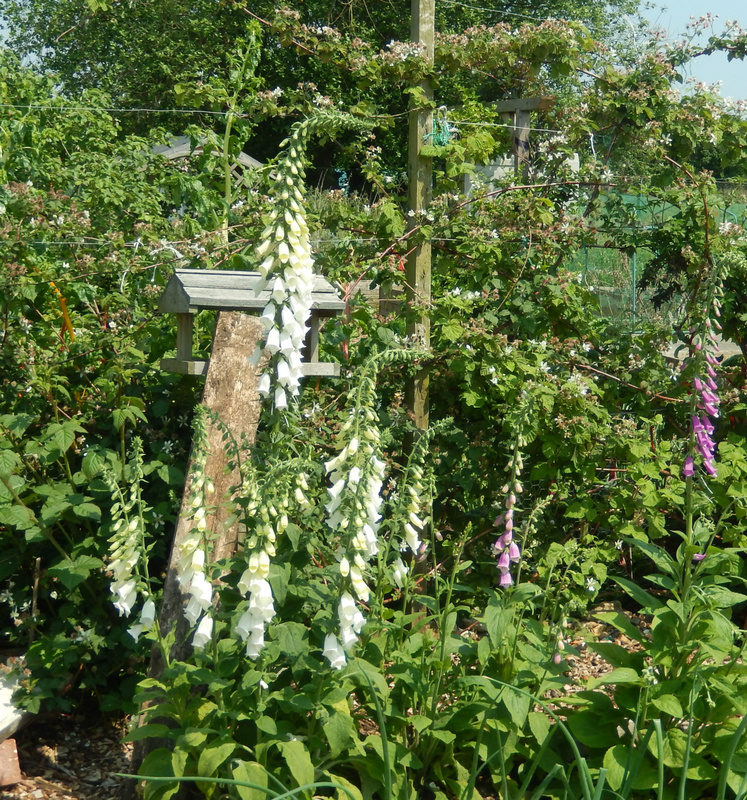 We keep them because they look good and give a bit of height to the plot, and it would be too difficult to remove them now really, even if we wanted to, so we might as well enjoy them for what they are. While I was balanced on a plastic chair, wielding my secateurs, Abi was strimming away on #145, which looks all the better for his hard work. You can see the vegetables clearly again for a start. We are rapidly becoming disenchanted with the whole idea of these green paths. It is difficult to strim them without damaging the luxuriant growth of plants such as nasturiums or potatoes, they are really wet to walk on when the grass/weeds need cutting and you have to negotiate them carefully, and strimming them all, ideally weekly at this time in the year, is really hard going. So, a decision has been made: we shall level the lumpy parts, pull out all the weeds we can, straighten up the edges of the beds and put landscape membrane down, with a layer of woodchip over it to make solid paths.The two sections at the ends of the plot will stay as grass. 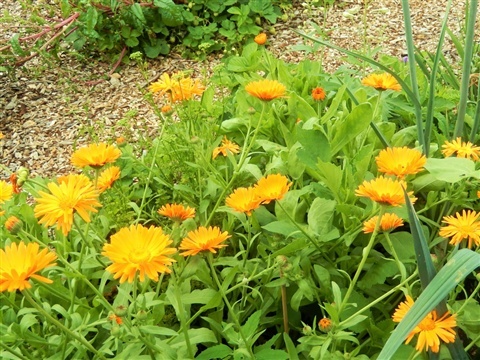 They are mainly grass not weeds too, which is helpful, and this is where the flower beds are, so it should look good. We hope. Membrane has been ordered, but please don't let us have to "edge" the beds with wood, as that would be hugely expensive and we are saving for those two 12m polytunnels. We have really wanted a small wildlife pond on #146 for ages, and have now managed to decide where it can go: near to the front gate. Having decided this of course, we now want to do it straight away, but there are the paths on #145 to deal with... I'll let you know how it goes. The bug round up this week has been fascinating. 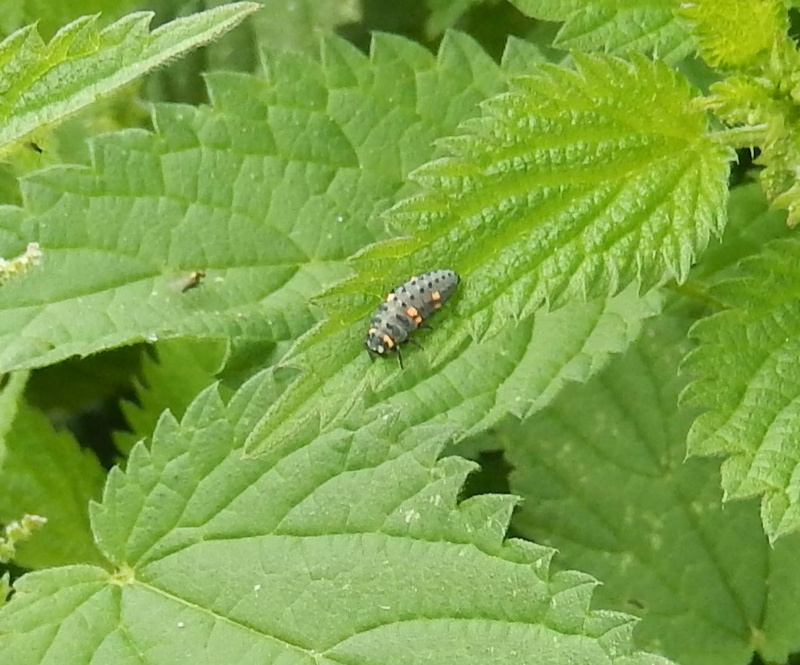 While I was clearing the nettles from behind the compost bin to up and add to the compost mix, I was watching the ladybird grubs chomping away on greenfly. There were grubs of all sizes as well as some pupae, and I was careful not to add them to the bin, as clearly they were doing a great job. I was there for ages, as there were potato haulms and apple tree prunings to chop, as well as a huge pile of broad bean plants (minus their pods of course) our plot neighbour had been going to consign to the dump at the end of the path, but donated to a much more worthy cause: our compost!! 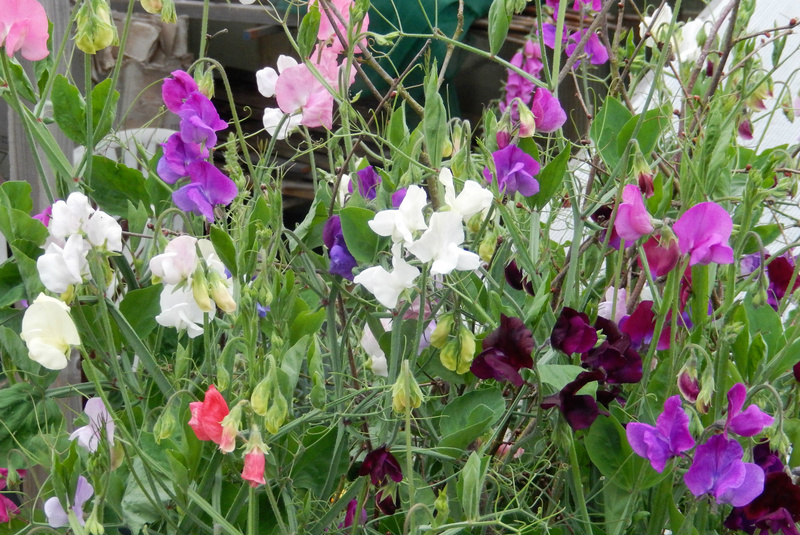 They also gave me a bag of ready-shelled beans in exchange for a bunch of sweetpeas, so we were all happy. I think I had the better end of the deal though, to be honest. 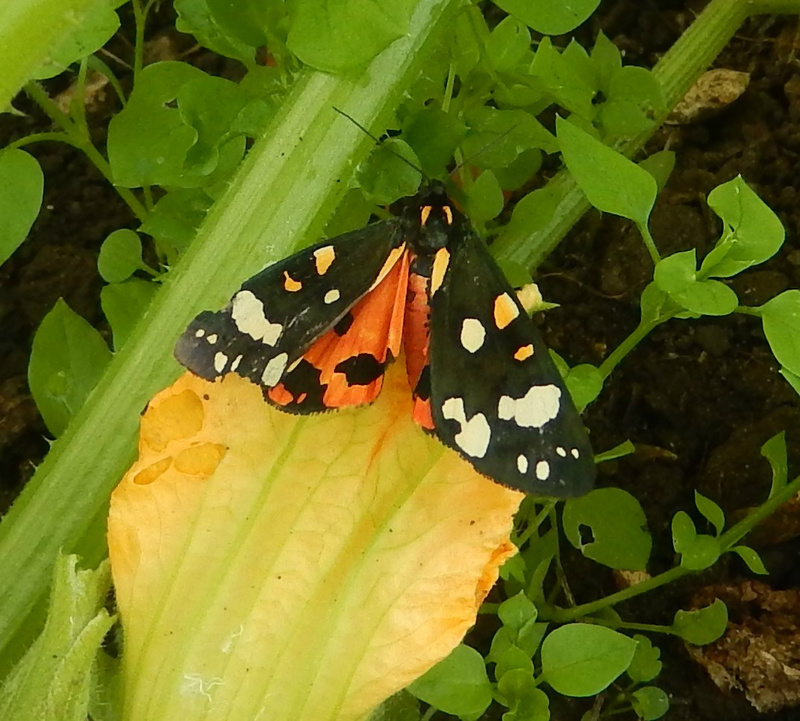 At this time every year we see the brightly coloured Cream Spot tiger moths flying slowly around, both at the plot and at home. 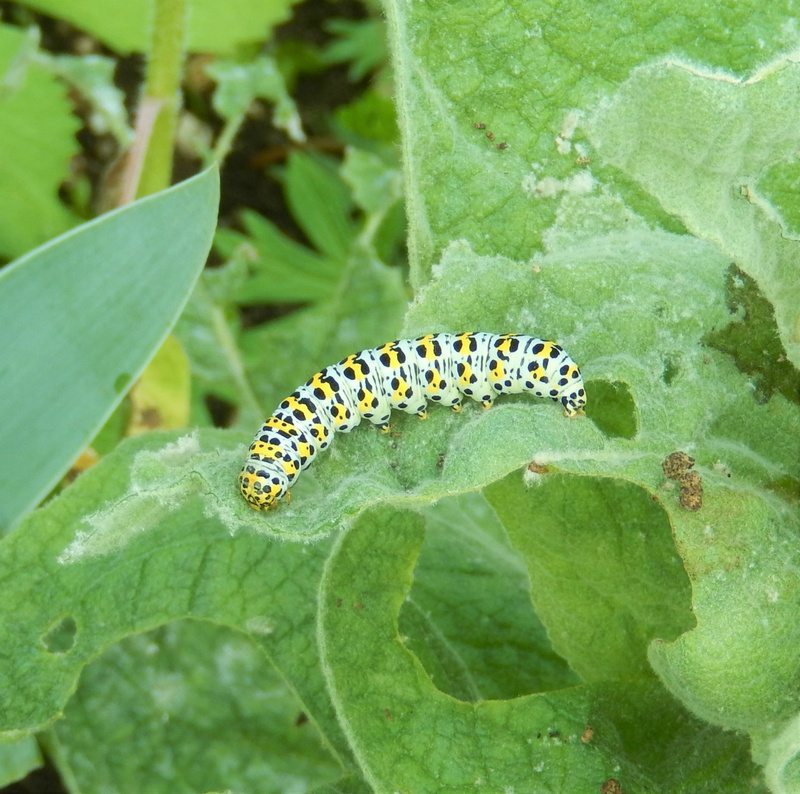 Their caterpillars feed on alkanet and forgetmenot here, and we leave these to grow especially for them. They are gorgeous, and one of our few day flying moths. 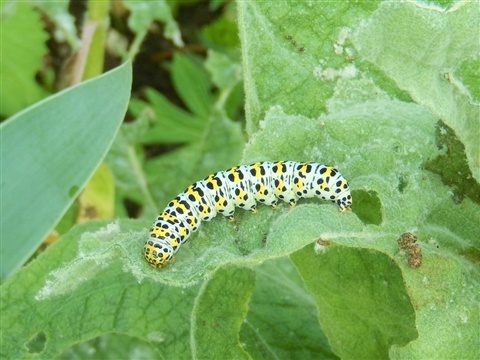 We also have a small colony of Mullein moths, which are quite dull looking brown insects that fly at night, but their caterpillars are amazingly coloured. 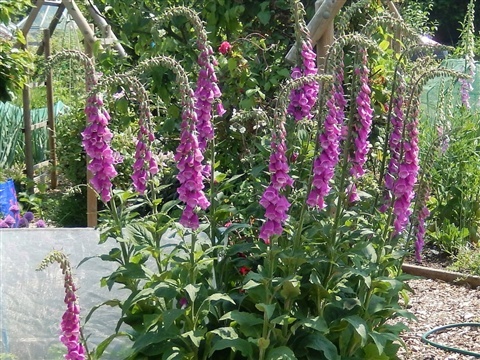 We grow mullein for them, and leave it to self seed so that there are plenty of plants for them to feed upon. 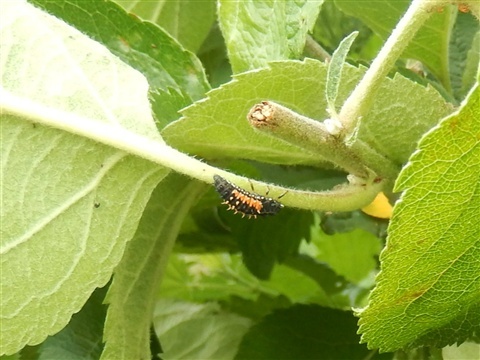 They pupate under the soil at the base of the plant, to overwinter and hatch out early next Summer. I think the caterpillars must be unpalatable to birds, as they make no effort to hide and sit out on the top of the leaves in the sunshine. Their colouring probably acts as a warning. 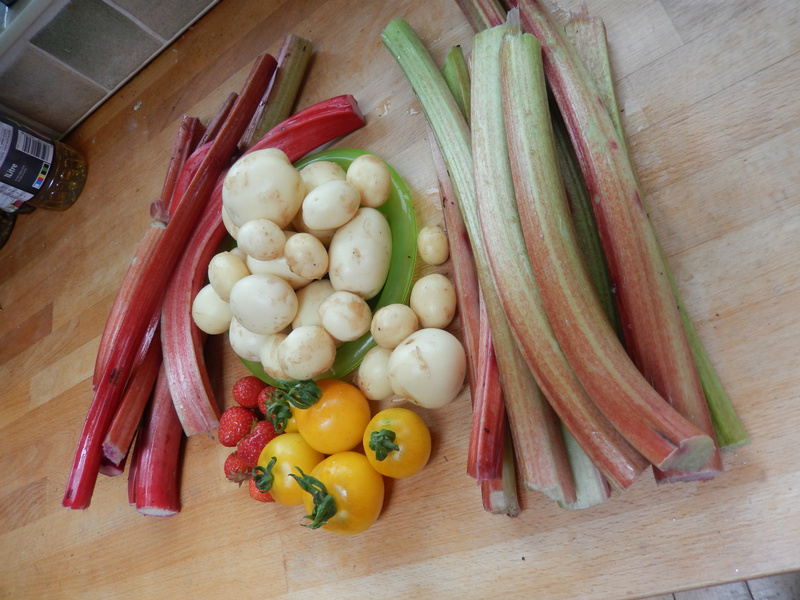 Soft fruit is coming along nicely, all except for the strawberries, which are maintaining the vole population very well! Tayberries are ripening daily, and it is hard to resist picking them when they glow such a beautiful red, but if they are left until they are purple they are much sweeter. the black birds love them too and make absolute gluttons of themselves with those that are low enough down for them to reach. Rhubarb is coming to the end of its season, so I picked a lot this week to make some rhubarb and ginger cordial (See tab for recipe) which is a glorious colour as well as being delicious. I used a mixture of the red and green types, but I guess if it had all been red stems the colour would be even brighter. First time I have made this but I shall be making more for sure! I bought some smaller bottles this week as they fit in the fridge more easily than the litre sized ones I used for the elderflower cordial. Roll on the blackcurrants. 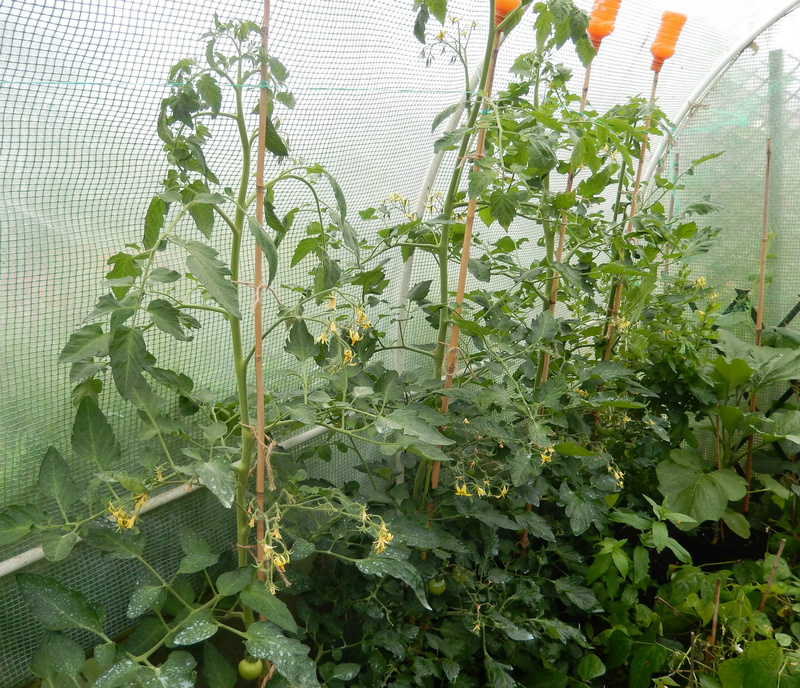 The tomato plants in the mini-tunnel are thriving, and heavy with green fruit. Yellow Sunrise and Black Opal are ripening slowly. 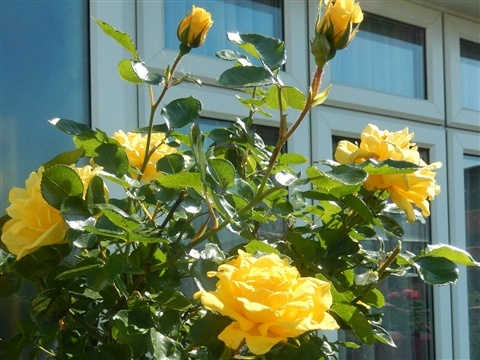 They are much older plants, remember... we do need some sunshine, please! 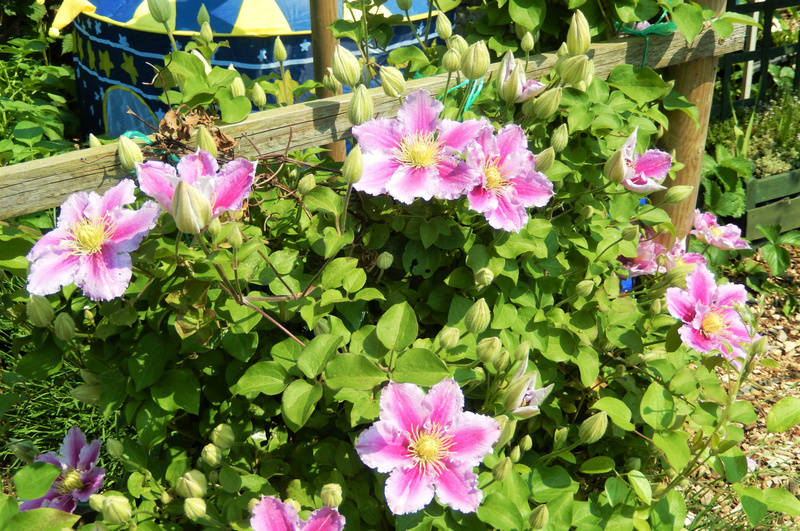 The multitude of plants outside are growing steadily and are just coming into flower. 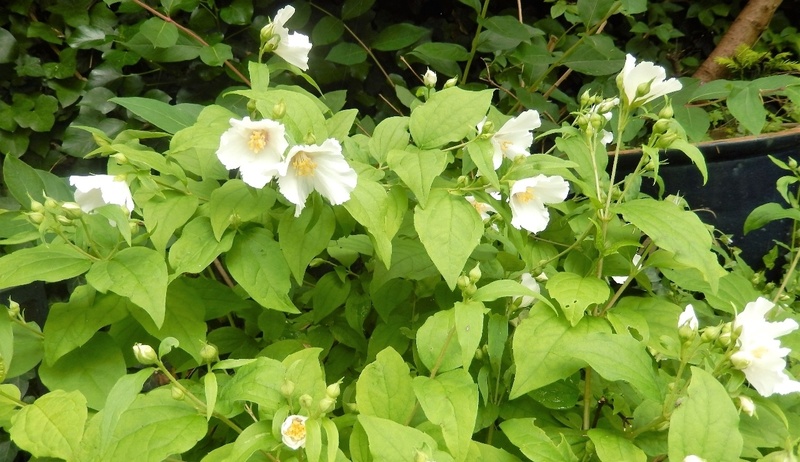 There is a wide variation in the plants of different varieties, with some being very thickstemmed and hefty looking and others being much more delicate in appearance. The plan of putting them in all sorts of odd spaces on #146 is all very well but some plants were in danger of being overwhelmed by nasturtiums, so there has had to be a bit of surreptitious thinning out to make sure the tomato plants get enough light. Once they are taller they should be fine. I try to remember to feed them every week, but it is a bit hit and miss as time just seems to fly by, but they seem to be coping all right thank goodness. 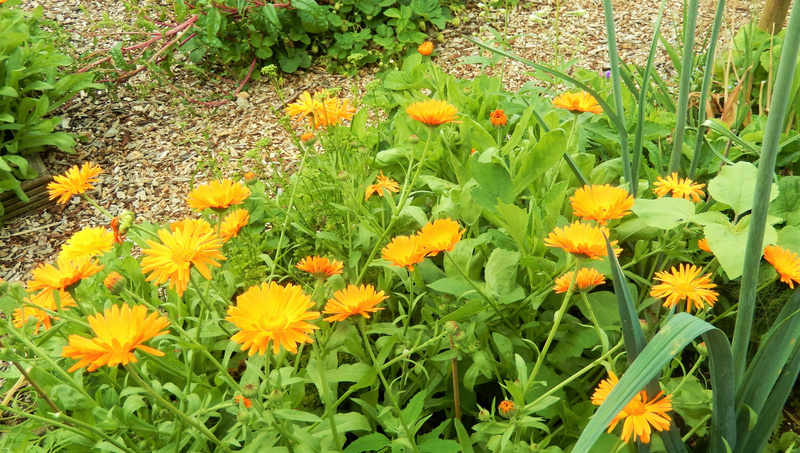 Pot marigolds (calendula) are flowering well now. 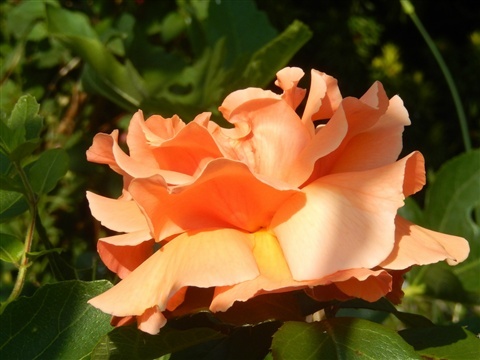 I shall be drying some petals this year to use in cooking. If you would like a message when updates are posted, please send an email to updates@alittlebitofsunshine.co.uk. Thank you very much. 21st June - Happy Summer Solstice!! OK, it is pouring with rain and we could not see the sunrise, but here we are, it's Mid-Summer's Day already. There is a full moon tonight,and I hope the skies are clear enough to get a glimpse of it. 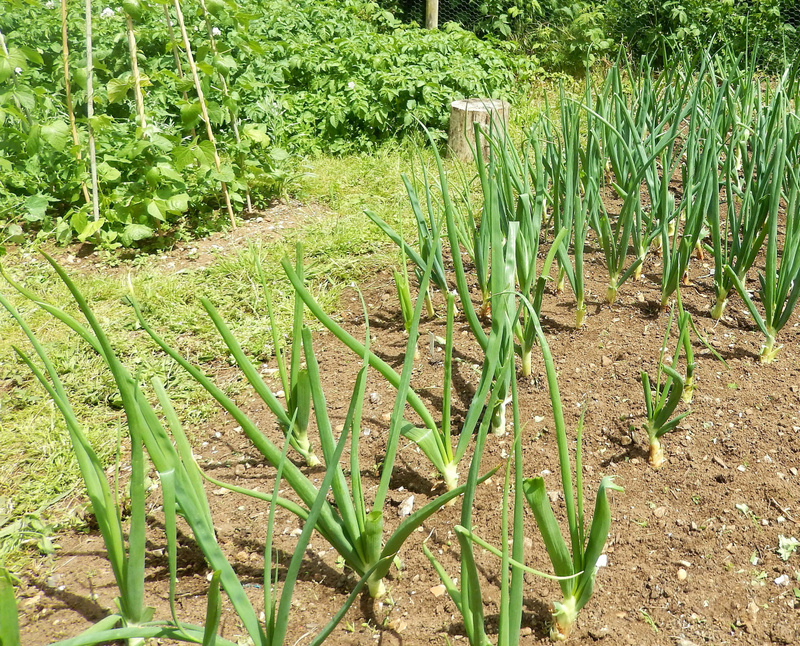 From here on, dayight hours will slowly start to reduce, and although it will have little impact on us for sometime, plants that are day length dependent respond much more quickly -- onions sown in the Spring will stop focussing on growing leaves and start to bulb up for example. I'm sure you remember the saga of our onions, both the Autumn planted and Spring planted ones and the issues with Allium Leaf MIner and so on? Well the Autumn ones are responding to Mid-Summer by tipping their leaves over and getting ready to dry out for harvesting. 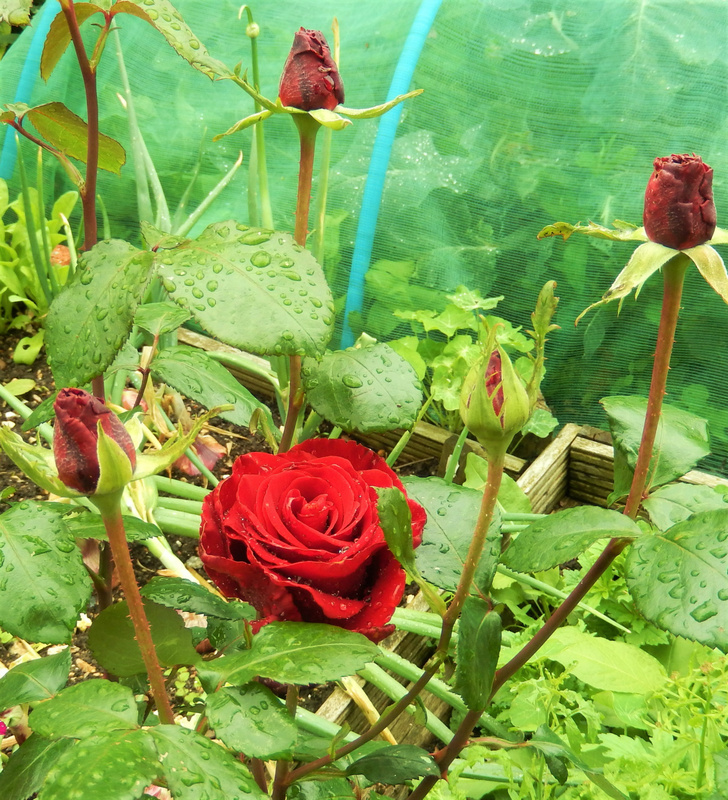 Drying out seems a bit optimistic today, but it does take a few weeks, so there is hope yet! Some bulbs look a decent size too, so I am hoping they do not have pupating grubs deep in their interiors. In days gone by it was advised that we bent the tops over to hasten drying, but ideas change and current thinking it that snapping the necks like this leads to rotting, so I am letting mine be, even though they do look very untidy like that all at odd angles. 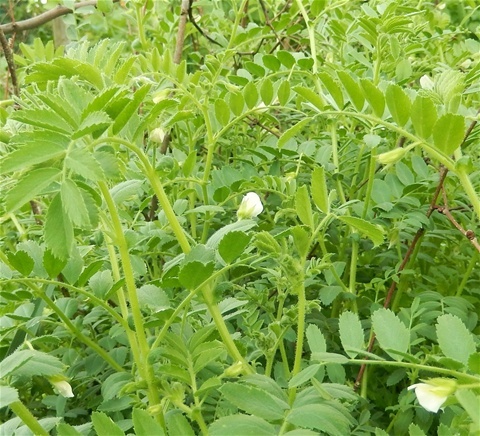 A heavy, prolonged rainstorm damaged the pea plants, badly bending down stems, so they are no longer growing well. There will be a few pods, but hardly the freezer-filling quantity we were hoping for. It is really my own fault. I should have tied on another supporting string for them, instead of leaving it to the next day -- tooooooo late! If it is not one thing it is another at the moment, but growing is not a predictable science and you can never know how things will turn out. No point in being downhearted, we can only do our best. The drying beans however are romping away and the Greek Gigantes have reached the top of their poles. 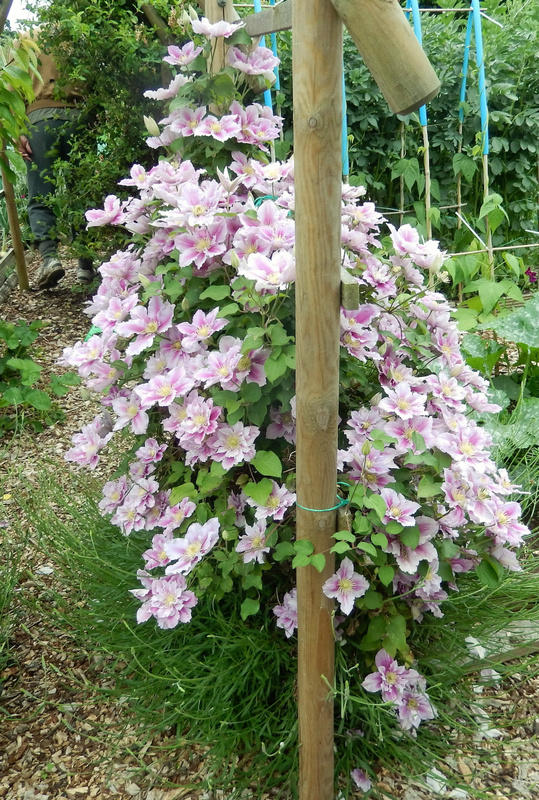 I shall pinch off the tops out tomorrow, so that they grow some side shoots instead of hanging off the end like flags, getting all tangled up. 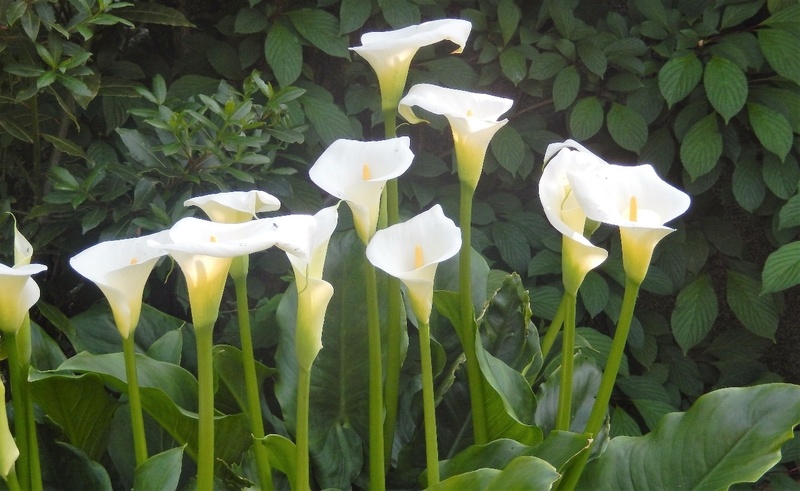 The others are much smaller plants and are unlikely to get so tall. On #145 the borlotti beans are almost at the top of their arch and looking healthy. One row is right next to the Wizard beans, and I have had to tie them right back to stop the others climbing up their stems instead of the arch supports. The Wizard beans themselves are setting pods galore, and any blackfly is soon squashed. Fingers crossed for some decent broad beans soon. All the chard in the runner bean bed has now been removed. It was not the chickens' favourite, so it was consigned to the compost bin, and the beans now need the space. Their leaves are looking a bit yellow, but apparently so are a lot of other people's. I am not really sure why, but I gave them a foliar spray of Epsom Salts and watered some in around them as well, in case it is Magnesium deficiency. When it stops raining I shall also give them a nitrogen boost with some chicken manure pellets. That should see them right. The mangetout in the mini-tunnel is really at the end of its production now, and so tomorrow it will come out and be fed to our daughter's chickens, to be replaced with a Telegraph cucumber plant and a Kiwano melon, which are currently in pots at home. 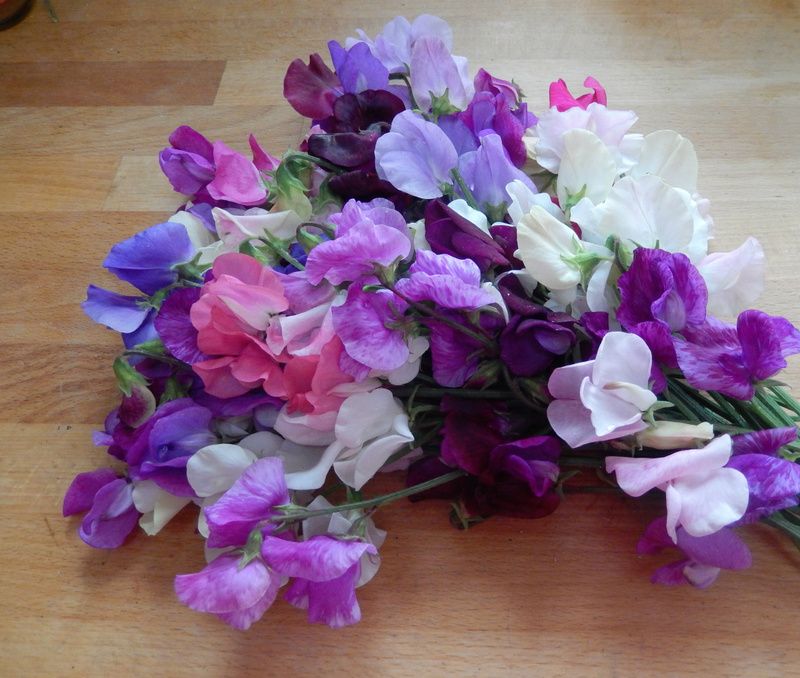 The Bijou plants out on the plot have started to flower - pretty pink and purple blossoms - so we won't be without fresh mangetout for long. 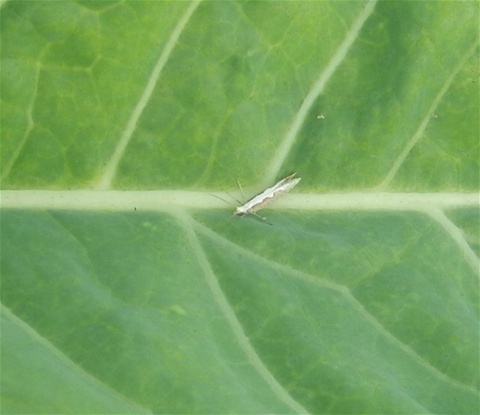 A Diamond-back moth on a cabbage leaf --- see their size! A "Plague of Biblical proportion" that could wipe out cabbage crops across the country, was predicted this week on the BBC news. A huge number of Diamond-back moths has been swept over from Europe by the wind and their larvae are apparently resistant to all known insecticides. I did wonder what those little whitish-grey moths on and around our brassica cage were. Bet they are not resistant to being squashed, I thought. Grrrrrrrr! When we looked, they were indeed the moths all the publicity was being given too and there were lots of them about too. 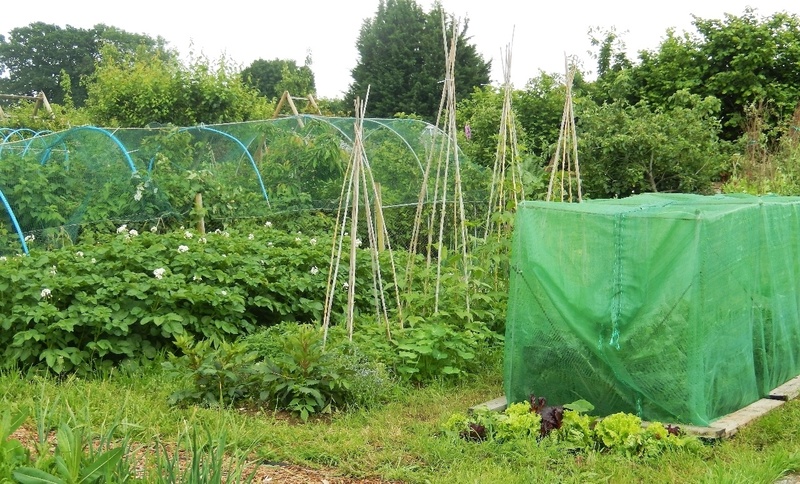 The answer - quickly sew up some debris netting to replace the butterfly netting on the cabbage cage, and put it on without trapping any moths underneath it. Say it quickly itsounds easy, but it took us over an hour. Time well spent? We shall see. Abi sewed, I squashed moths, and eventually the new cover was in place. The remaining moths clung on to the outside mournfully... not for long: I squashed them too when I could catch them. Moth Massacre at the Plot! Time will tell if it was soon enough to prevent serious damage. Fortunately the calabrese and Summer cabbage were already well protected, although there were moths around, attracted by the brassica smell. At home, the greenhouse has turned into a tropical-feeling jungle. 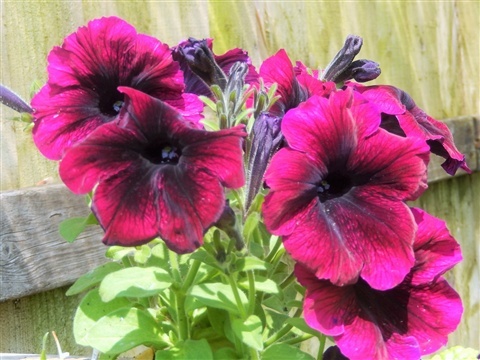 The aubergine plants are immense, The grafted Scorpios, which in their pots are now chest high, are in flower, and the slightlymore modest seed grown Black Beauty have well and truly outgrown their space on the staging. I am going to transfer three of them to the path in the mini-tunnel this week, when the juggling of mangetout and cucumber plants is over. 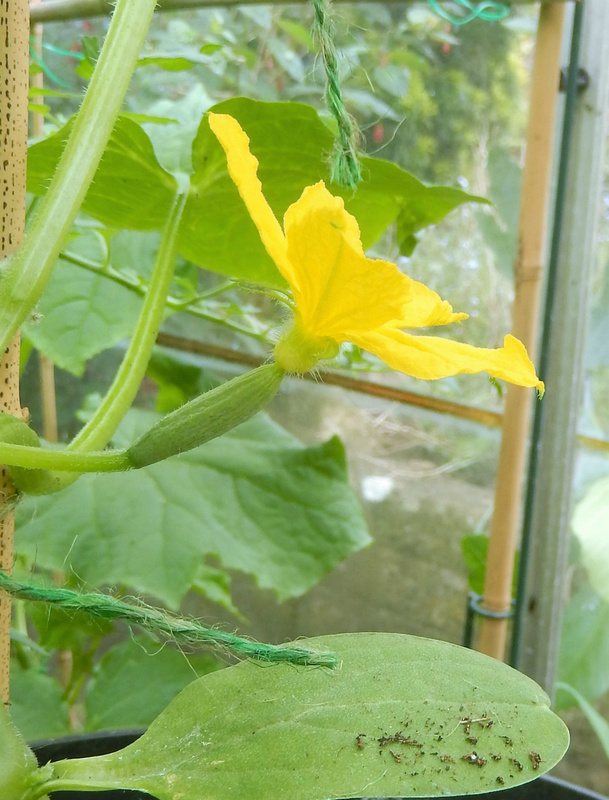 And as for the cucumbers they are almost to the roof, and their huge leaves are cutting out the light to the tomatoes, which are struggling on with lots of flowers on them, but how long they can manage for I don't know. I might have to take the shading off one side of the roof I think, or will the cucumber leaves them scorch in the sun... it is mid summer, after all. 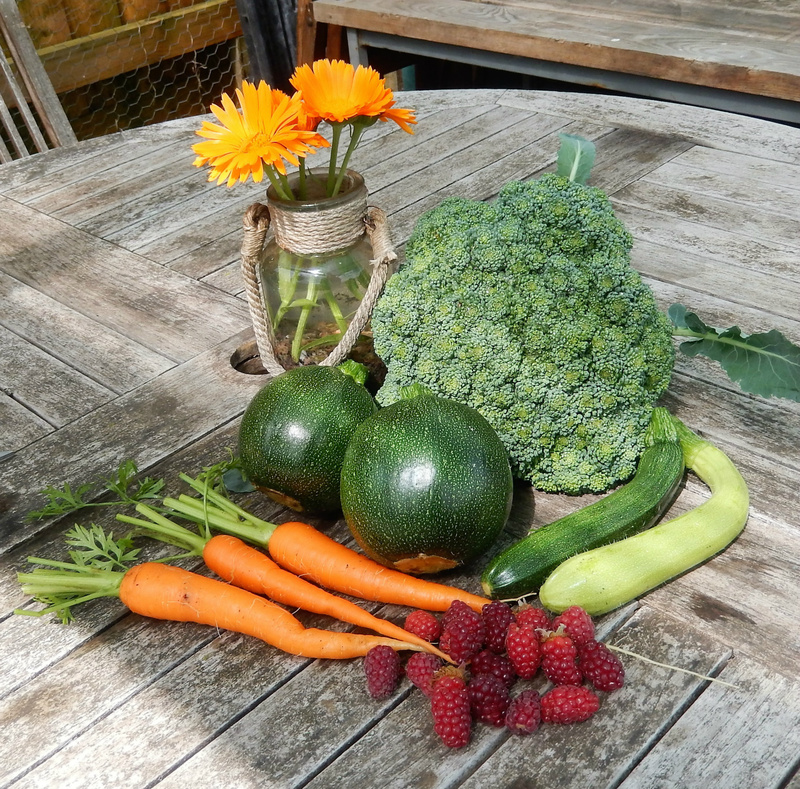 Despite all the trials and tribulations on the plots, we have had some tasty meals, with harvests including turnips, new potatoes, lettuce, radishes, tomatoes, calabrese, french beans, mangetout and rhubarb, plus our delicious elderflower cordial. 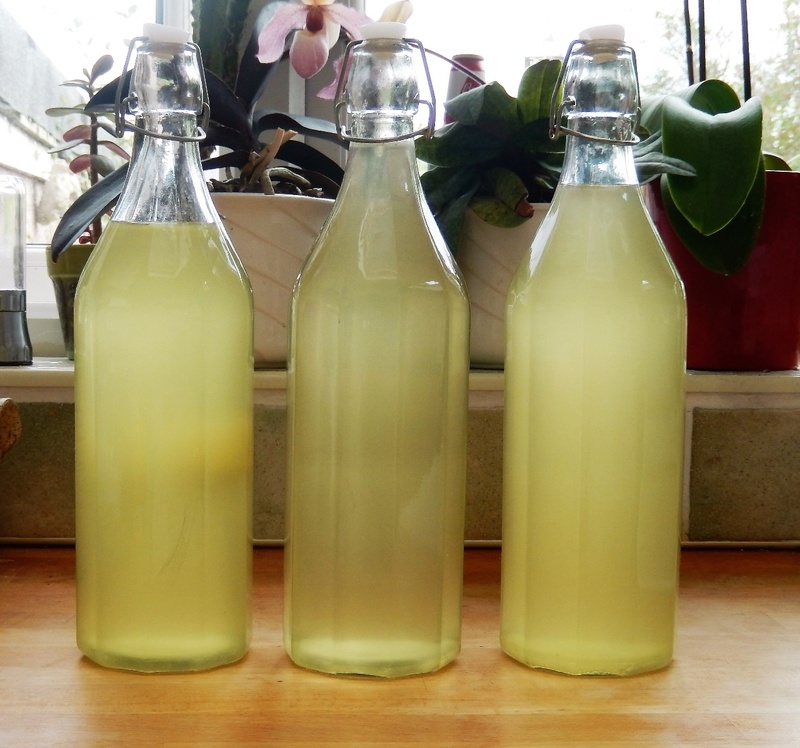 The second batch of elderflower cordial - already drunk some of one of the bottles! 6th June: The Year of the Maggot!! You know how the Chinese calendar attributes names to each year? Well round here this is now officially the Year of the Maggot!! First there were the Onion Fly grubs, and now there is an as yet unidentified similar maggoty creature in very large numbers living inside the below-ground stems of my squash plants, killing them off in rapid succession. 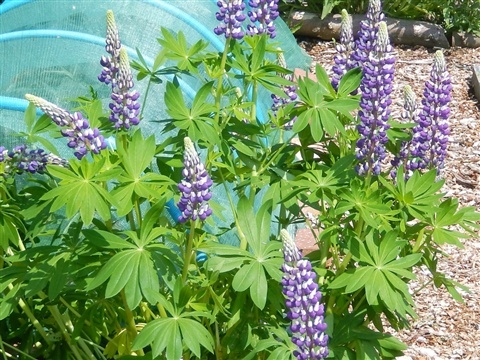 They were so healthy looking when I planted them out (and those given to other people remain so, hence I am certain that this is not a pest from my greenhouse or garden at home but something that has struck since the plants arrived on #145. Out of sixteen plants I now have only four left, and they don't look too clever. 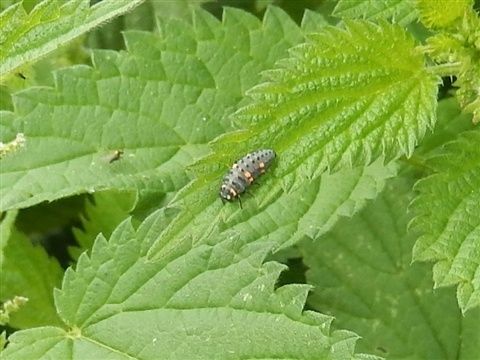 I have sent for some mixed nematodes in the hope that one of them likes eating these little blighters! June got off to a really really cold start here, with temperatures lower than those on Christmas Day .. hot water bottles came out of hibernation for a while, I can tell you. Now however we have hot sunny days and everything needs watering again. I even had to construct a temporary shade net for the outdoor cucumbers as they were losing water through their leaves faster than their roots could take it up. Never a happy medium it seems. It is a very odd kind of time in the year, when, after all the frantic sowing and planting there is almost a hiatus, where we seem to be poised waiting for harvests to begin, but too soon to start sowing Florence Fennel or Pak Choi, as they will only bolt if I don't wait until mid July at the earliest, and follow on crops like Leeks or Kale have no where to go yet! 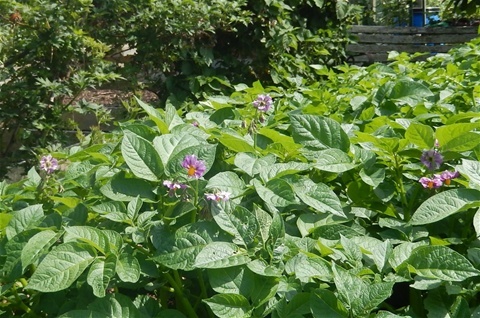 The first potato flowers opened this morning - Maris Peer. 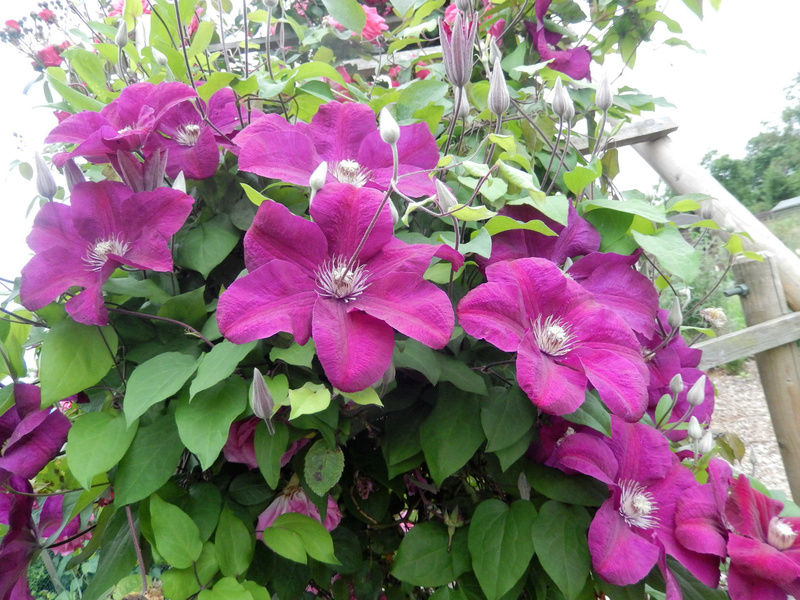 This was described as a second early variety, but following the advice of our friend Chris, we planted them with the first earlies and, sure enough, they win the race to flower first. 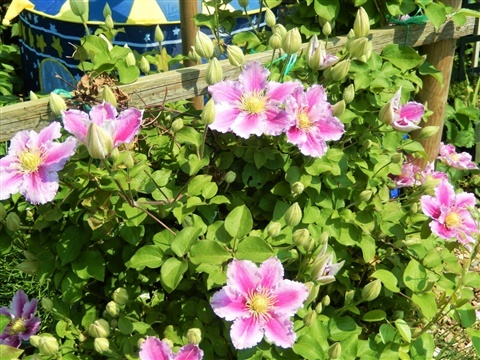 Flowers tend to equate with action down below ... plenty of foliage so tubers now required please. 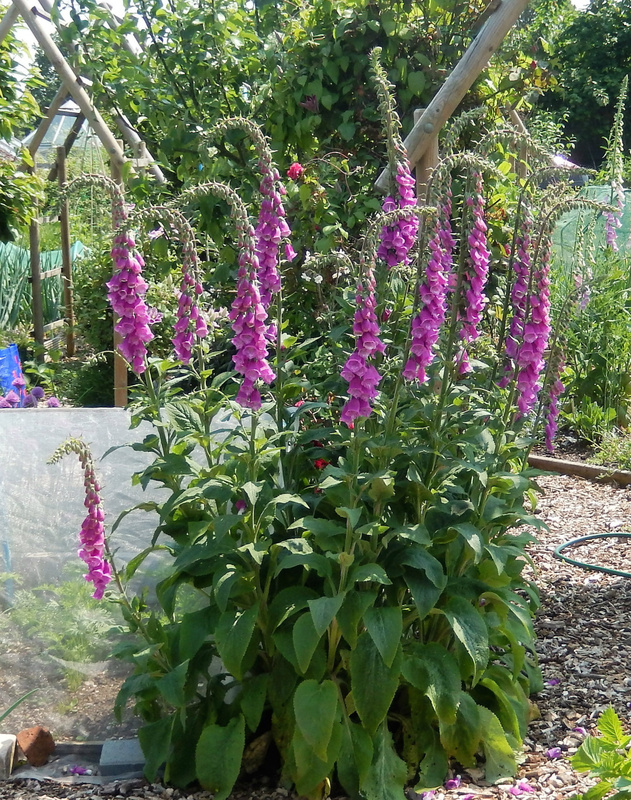 There are so many gifts of Nature at the moment: Foxgloves, Poppies, Sweetpeas, Love-in-the Mist, the occasional courgette plant, all growing where they chose and looking amazing. 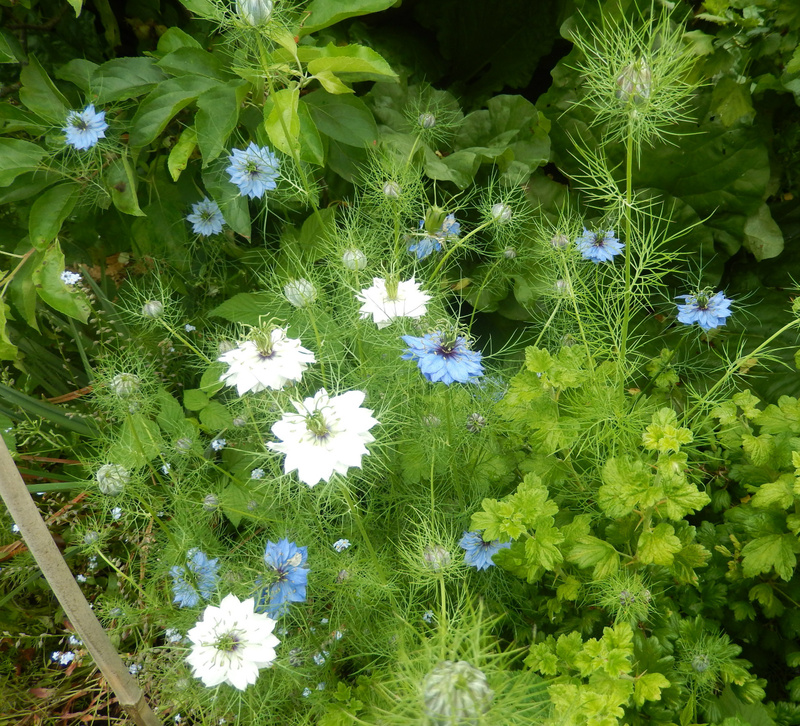 Who would sow Love-in-the-Mist amonst the gooseberry bushes? Not me, for sure, but there they are to delight us as we walk along the path. 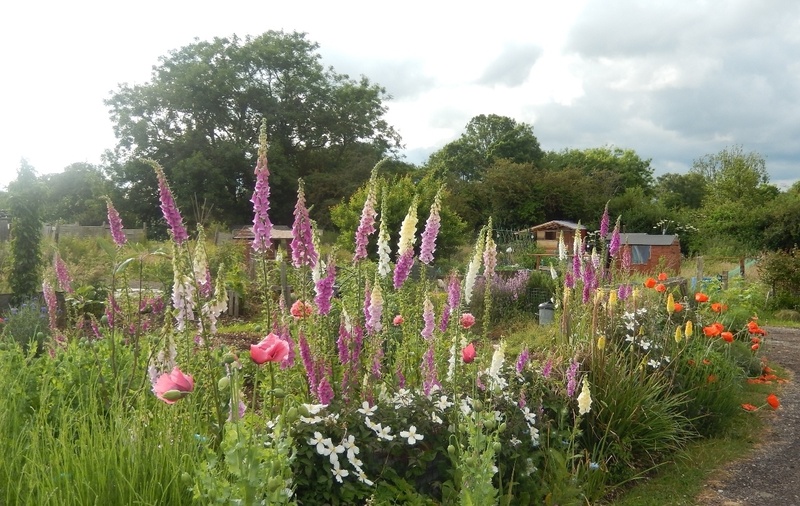 Our friends' plot delights so many people as they pass by with its glorious display of self sown beauty. There is another gift right now though, one that lasts such a short time but smells of Summer -- elderflowers. 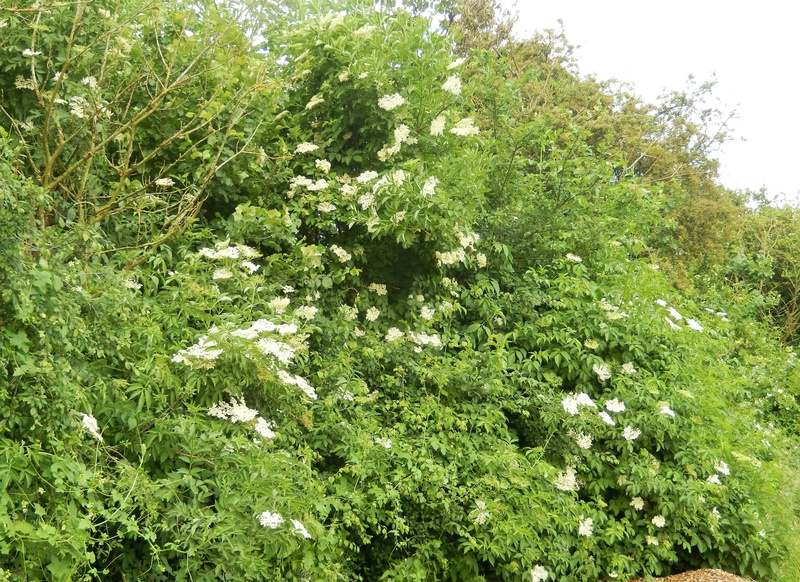 The hedgerows adjoining our site are positively dripping with their honeyed goodness this week, and so I have embarked on making elderflower cordial. With some help from our youngest granddaughter, I picked enough heads to make the first batch. "Don't pick them all Nannie, you've got to leave some for the bees!" was her advice, and leave some I did, as the berries later in the year are another bounty to look forward to, once the bees have done their work. Back at home, in went the lemons, the sugar and flowers, and it smelt amazing even then. 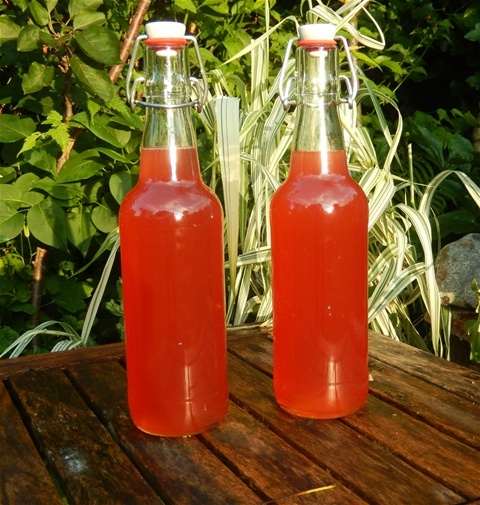 Today it is ready to bottle and we shall have a tall glass of elderflower and tonic water over ice tonight with dinner. Tomorrow I shall start the second batch! Undercover growing has made some real strides this week. 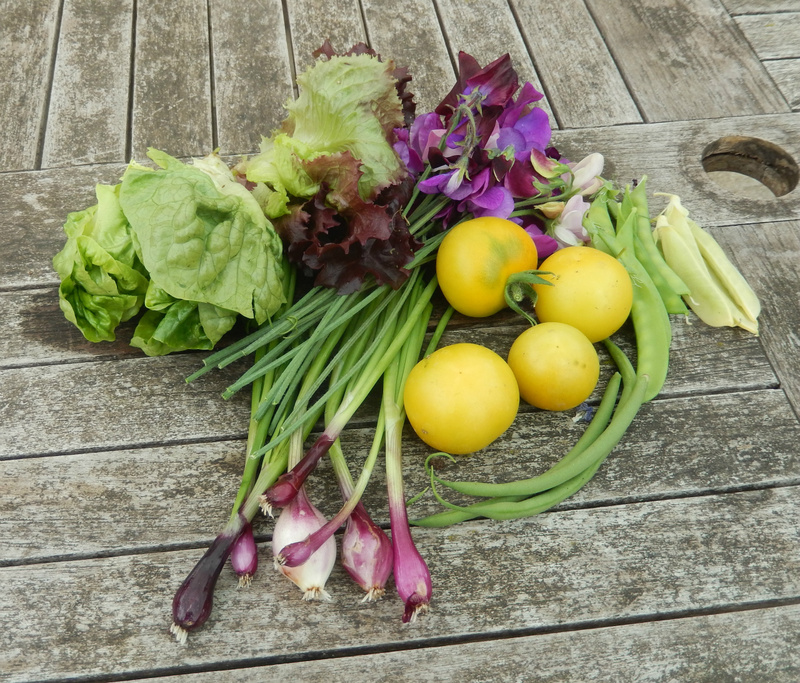 In the giant cloche on #146, the tomatoes are setting fruit and the chilli plants are beginning to flower, whilst in the mini-tunnel the Yellow Sunrise tomatoes are ripening, the Aquilon french beans are harvest size and the two mangetouts are giving us huge handsful every day. 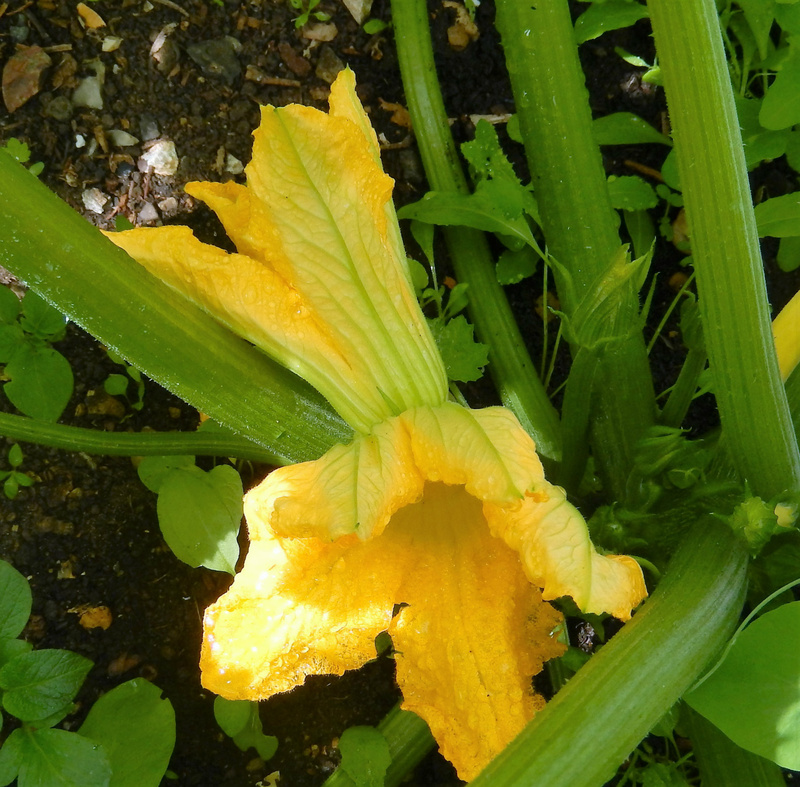 They are so sweet we mainly eat them in salad, but sliced they made a great addition to Thai fish curry last night. 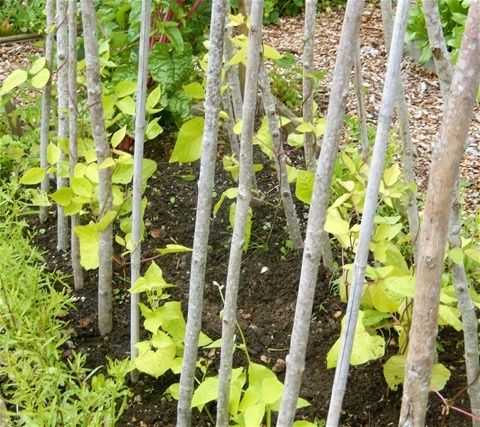 The gherkin plants are thriving in their special covered corner and are racing up the trellis, although there is no sign of any flowers yet. At home in the greenhouse the Diva cucumbers, which are in twelve inch pots this year, are in flower, and the Telegraphs, planted in the bed, are getting taller every day. Looking forward to some tasty fruits, but saying that quietly as cucumbers do not always behave themselves. 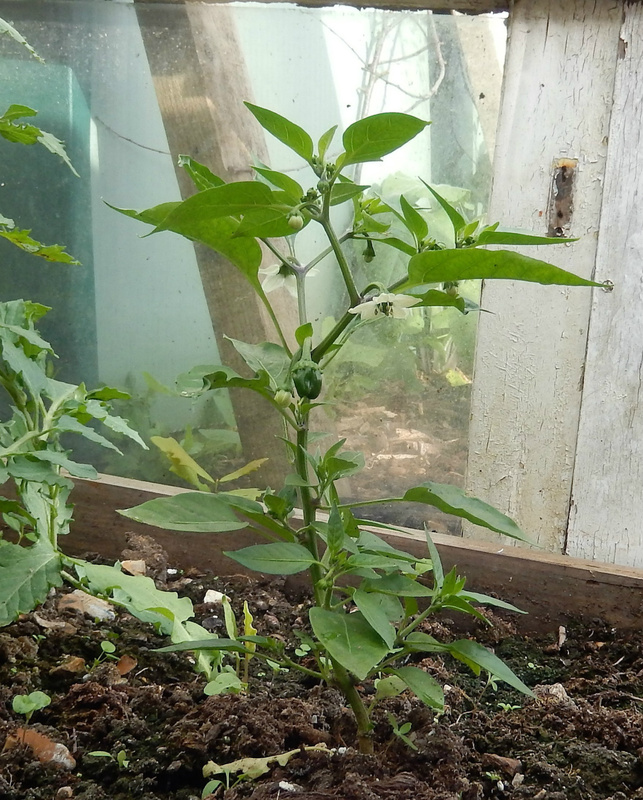 The chilli plants that were grown from seed are full of buds. I pinched out the tops of the two Lemon Drops and the Bangalore Torpedo, and they are bushing out nicely. 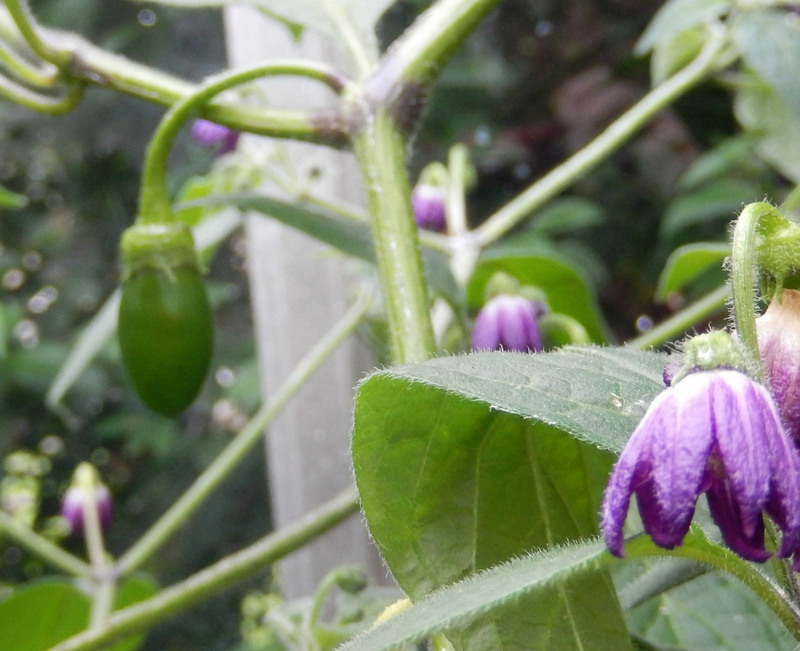 Last year's Alberto's Locoto Rococo is busy setting fruit daily. Long may that last! The Black Beauty aubergines grown from seed look good, but have been overtaken by the grafted Scorpios, which are now in eighteen inch pots and developing flower buds. After last year's decimating outbreak of Red Spider Mite, I am trying to keep up the humidity in the greenhouse in the hope this deters them. 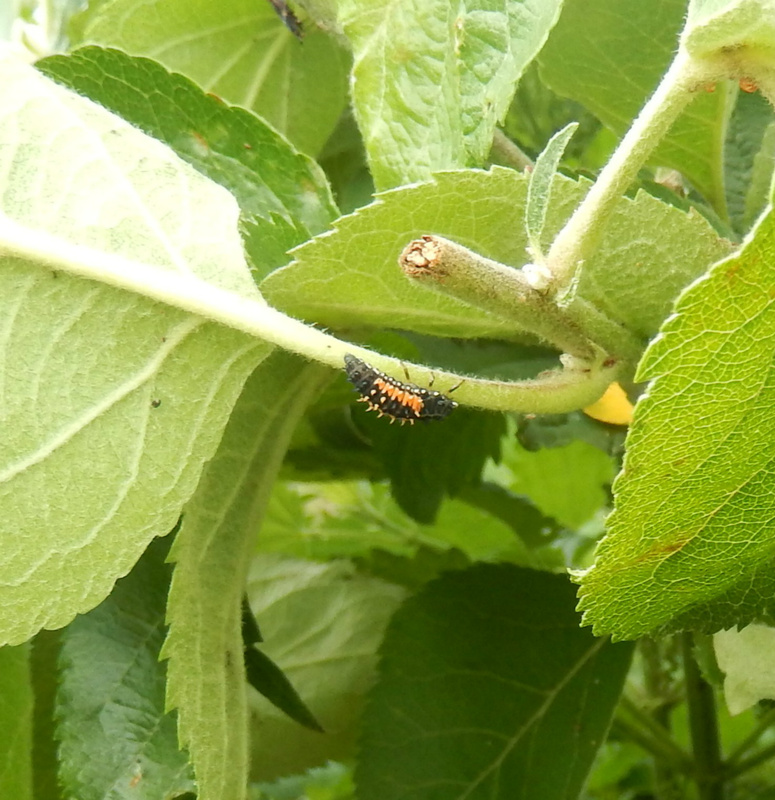 The season began with that massive influx of aphids so squash any invaders daily, before they can get a foothold. 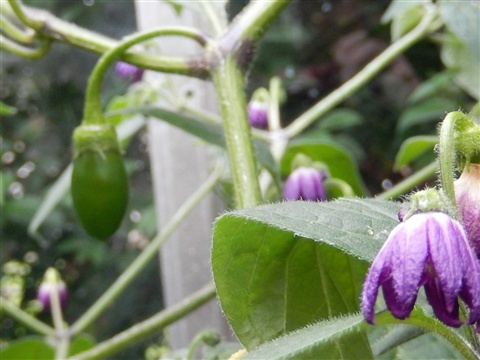 It is easy with the chillies in smaller pots as I can tip them up to check the underside of the leaves but it is a bit more awkward with those huge aubergines... contortions required!! 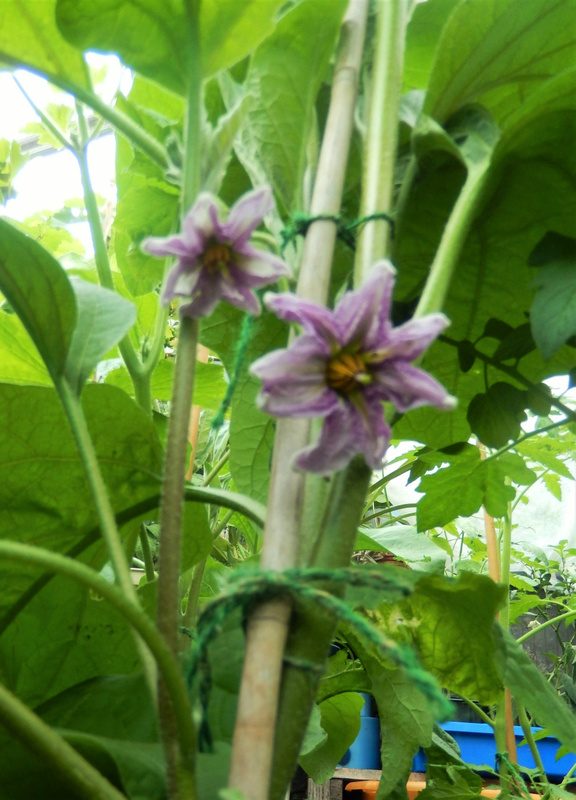 The three tomato plants are growing well despite being a bit overshadowed and are on their third truss of flowers. Onions update: I was wrong about the pest identified inside the onion stems: apparently it is Onion Leaf Miner, and taking off the damaged leaves will have restricted its impact on the crop, and they are growing nice new healthy looking leaves now. Onion Fly lays eggs in the soil, and the grubs attack the bulbs directly. I shall still be employing enviromesh covers when the leeks are planted out, as the flying pests will then be prevented from damaging them, both the Miner and the dreaded Leek Moth. Flying pests come in all sorts of shapes and sizes -- pigeons discovered the redcurrants ripening before we did, and were gleefully helping themselves to the berries. This morning, despite a heavy drizzle, we put the nets over the fruit cage frame to spoil their fun! The jostaberries, redcurrants, blackcurrants (which look like a massive crop and blackcurrant cordial is on my list! 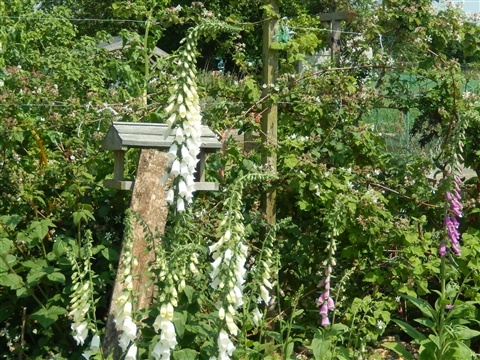 ), and gooseberries should now be safe from the attention of pigeons and those stealthy blackbirds that try to sneak under any gaps in the net at ground level. They run about like little old men in the undergrowth. We were given an old mini-tunnel frame which we have been able to incorporate into the cage, which is slightly taller than the cane-and -blue-waterpipe construction, so at least we shall be able to stand up in part of it. It is 14m by 2m overall, so having two of us to position and secure the net was brilliant. Photo to follow next week, as t started to rain harder and we beat a hasty retreat! Flying pests have decimated the squash plants too. Five do seem to be limping on, and hopefully the application of some nematodes that feed on the grubs will have helped. 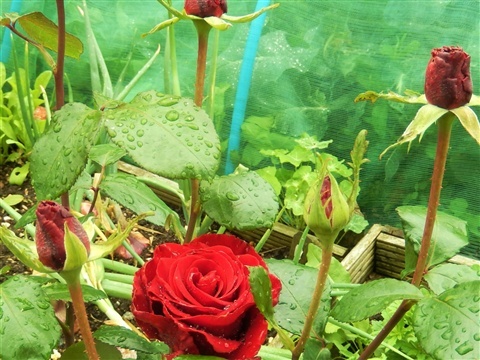 (from Nemesys) Our daughter, who was the recipient of some of our plants, has bought a Delice plant for us, Jane (of flower border fame) gave me a small Rouge d'Etamp and I have sown some more seeds, a couple of which are up already. I am determined to have squashes!! Took this photo yesterday. This morning there were three flowers open on this Diva plant. Hope the grow quickly! Alberto is setting fruit. Last year they grew to the size of tomatoes, so this one has a way to go yet. The weather has been variable, mainly dry despite the regualr forecast for rain. We did have one terrific downpour yesterday and I was convinced that the potato plants were goin to be beaten down with the force of it, but no, they were just fine. 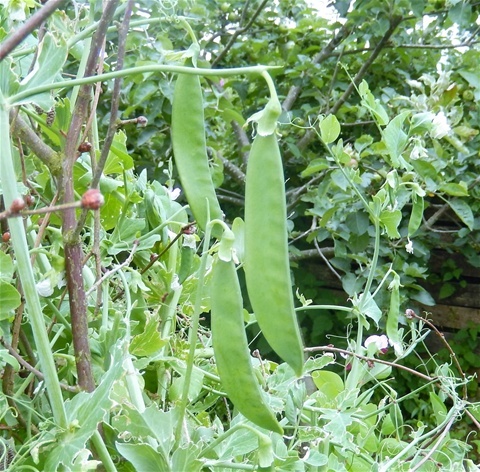 the tall peas on #145 however, were a bit of a casualty and lots of the stems were doubled over. After a bit of a rescue job this morning, and some string around the twiggy supports, I think they will be alright. Lots of flowers though. It does seem that having the irreguar tops to the twiggy and cane wigwams prevents pigeons sitting there and feasting. Good! Some of the climbing bean plants needed some persuasion to anchor themselves to their poles, but all are heading upwards now, just like the magic beans in the story of Jack and the Beanstalk. All we need now is some flowers please. 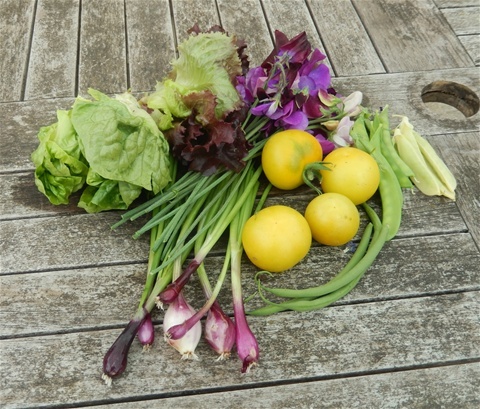 In amongst all the pest repellant efforts, we have had some welcome harvests this week: yellow and green mangetout, lettuces Yellow Sunrise tomatoes, Aquilon french beans, Purplette spring onions, chives,sage, rosemary, rhubarb and a bunch of sweetpeas. Sometimes you wonder how anything survives long enough to produce something edible!! Weeds however, are the real winners in the growth stakes, unfortunately. On #145, until this morning all we could see was vegetable plants peering over a sea of weeds. The paths and beds seemed merged into one, and it was all a bit depressing to be honest. Seven years weeds equals seven years seeds... deep joy when you have a new plot. But Abi got out the strimmer and worked away for hours cutting the paths and other green areas inside the plot, as well as the grass on all four verges.He got carried away and did our neighbours' boundaries too, which I know they will appreciate. 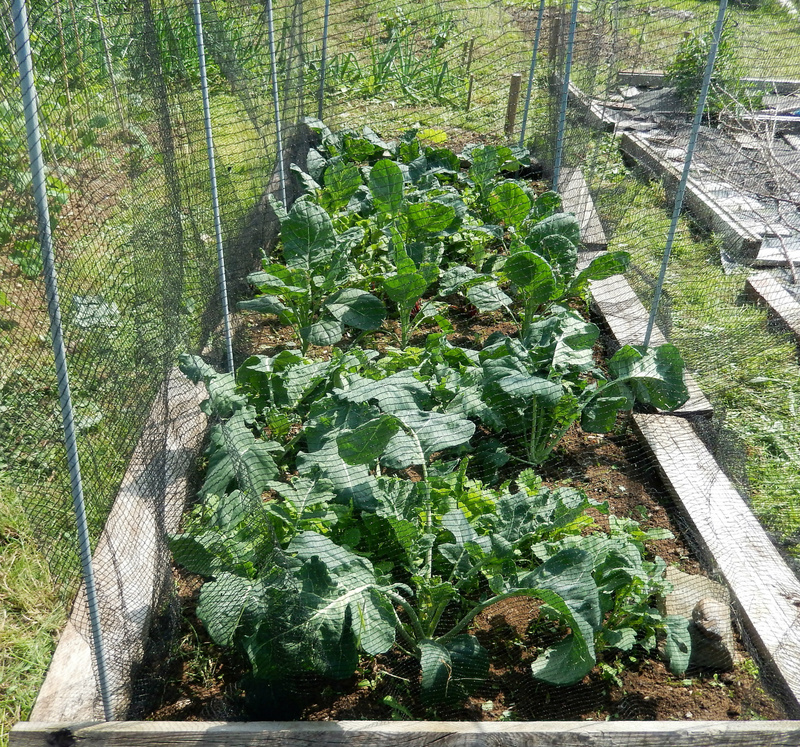 I set to and weeded the brassica cage. Goodness knows whether the rocket has survived but I left a strip of green where they had been originally, but the radishes and turnips are fine, and the beetroot look very healthy. I actually managed not to snap off too many leaves from the sprout plants either. 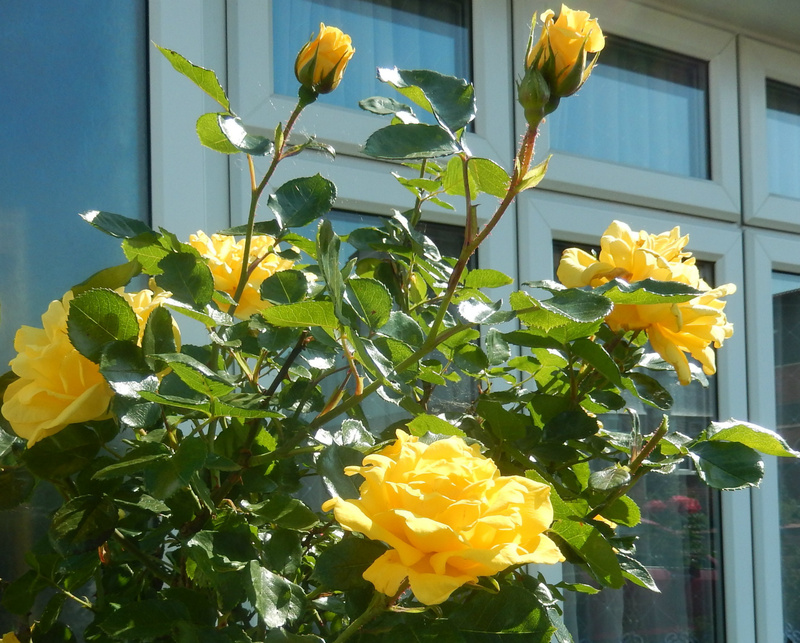 They are one of our nemeses so I am trying to take special care this year to give them what they need to succeed ... I hope! 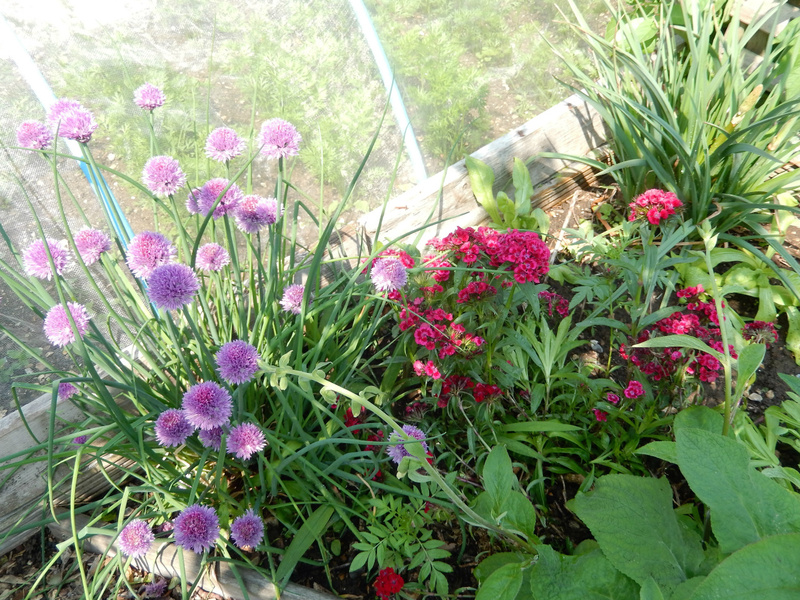 On #146 however, weeds are much less of a feature thank goodness, with only one of the onion beds needing attention really, Oh, and the back of the fruit bed if I am being totally honest. I know those weeds are lurking in there even though they can hardly be seen and I want to deal with them before the nets go on. I netted the strawberry bed today, as the two ripening berries have already disappeared, no doubt into the beaks of marauding blackbirds. The net is secured all around so I hope no birds find their way in and get trapped. They seem to find the tiniest gaps and get very distressed when they cannot find their way out again. 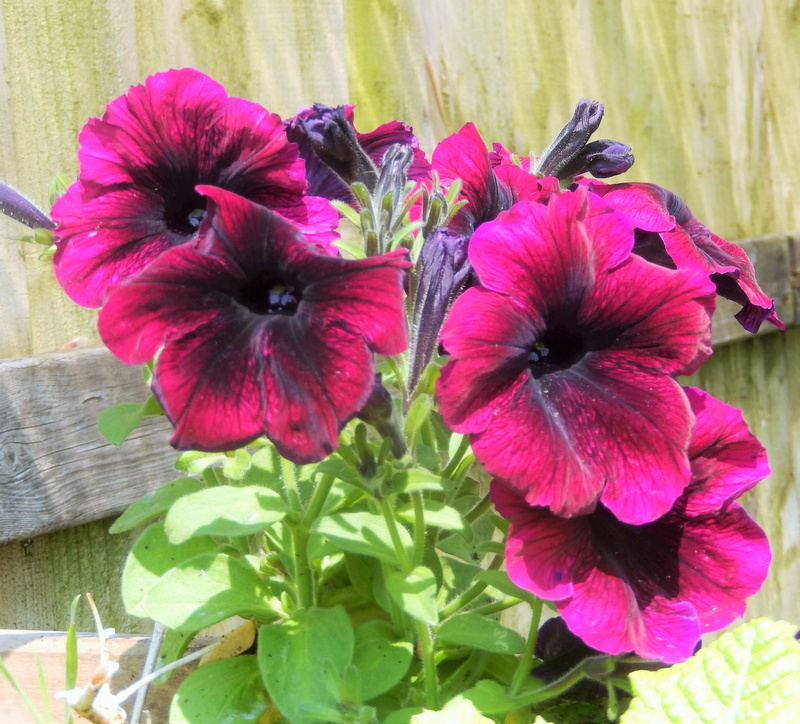 A surprising overwintered petunia, in a wooden box on the side of our seating area on #146. 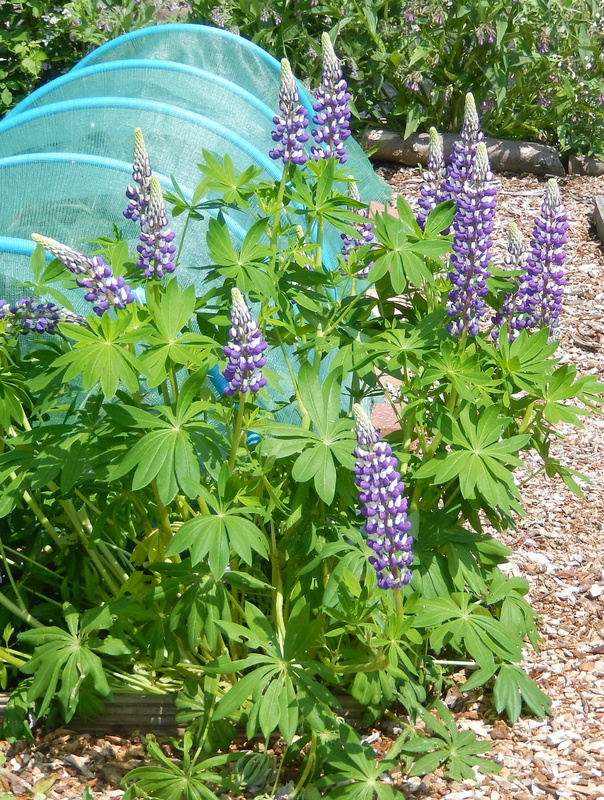 We have just one lupin, which grew from a stray seed, and gets larger every year. 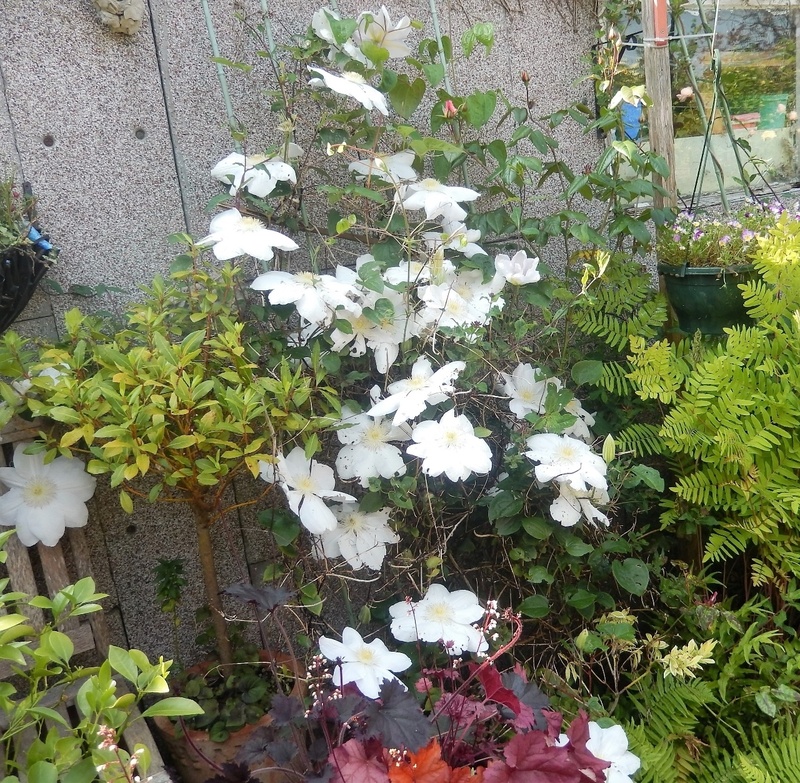 We have a large white clematis by our backdoor, and the new lime green growth of the surrounding ferns, together with the reds of the heucheras sets it off a treat. Bedfordshire Champions and Hercules on #146, enjoying their freedom! We have worked hard to release the onions from the clutches of weeds this week. On #145, the docks had to be dug out individually by hand -- thank goodness there will not be a storm of seeds coming over the fence this year from #146, where this year there is a plague of thistles, which, if you pull slow and steady, can come out complete with their long root. Plenty of opportunity to perfect this technique! 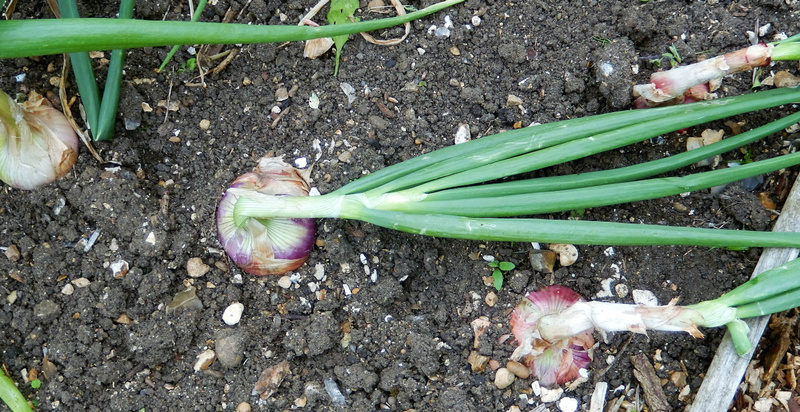 There was a sudden attack of rust on the garlic, so I took off all the leaves and left the bulbs in the ground until there is time to harvest them. The one I did dig up (couldn't resist) was a useful size, and smelt good and strong. Not sure if they will dry off for keeping or not, we shall have to see. The Elephant garlic is still growing away, a couple still with scapes on that we haven't eaten yet, unscathed by rust, despite only being a metre away. Who knows why? 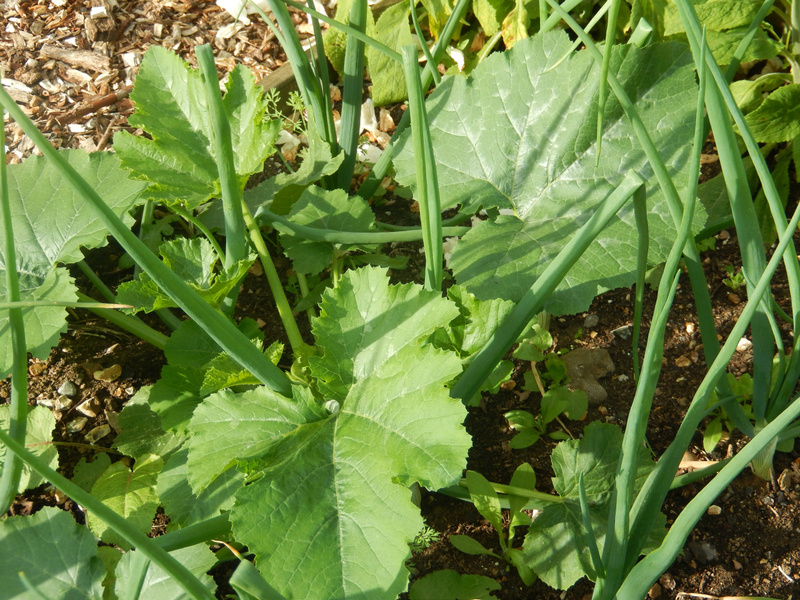 The shallots' leaves are still green too, so apart from weeding I am leaving them be: I can see lots of bulbs, and as this is the first time I have grown long shallots rather than round ones, it is quite exciting waiting to see what we shall have at harvest time.